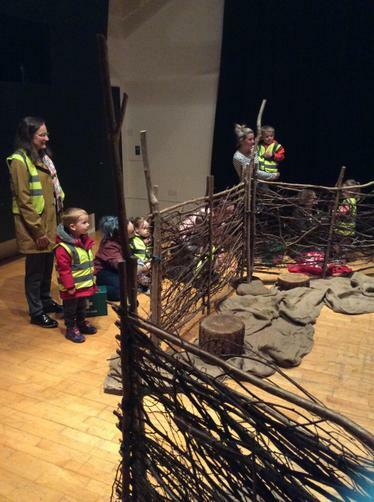 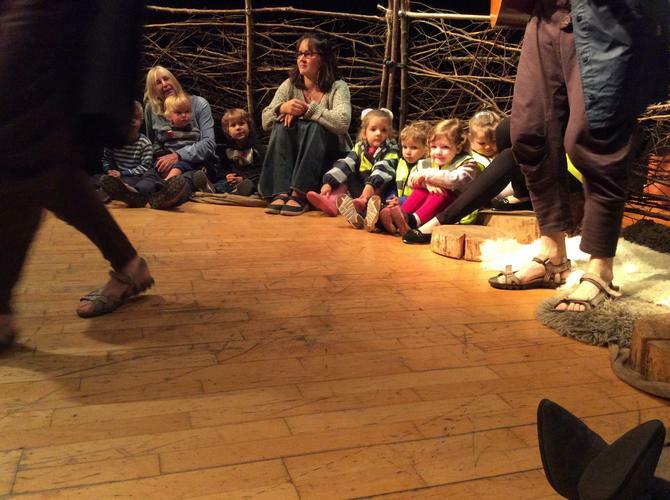 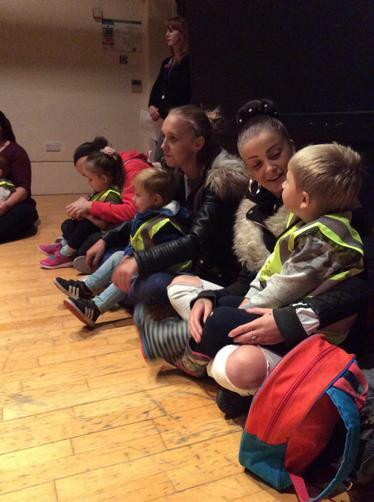 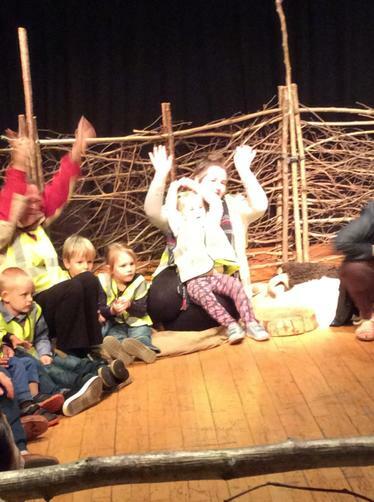 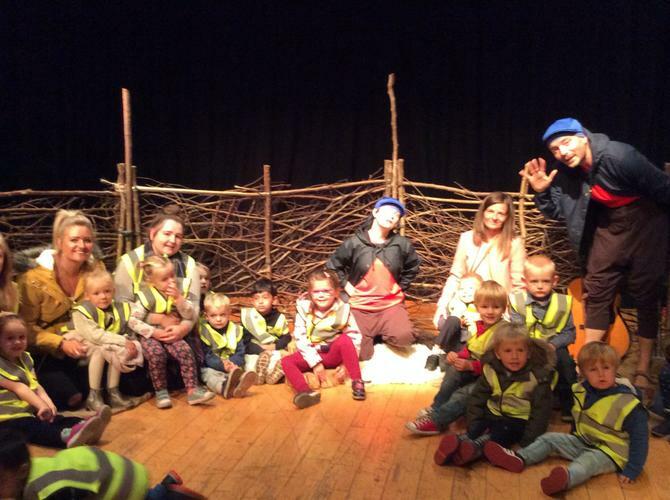 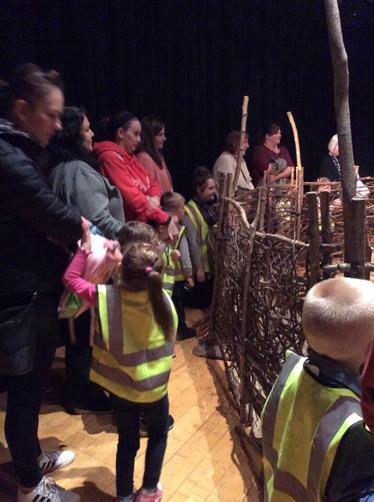 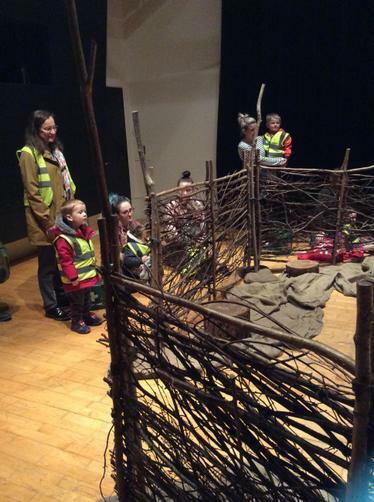 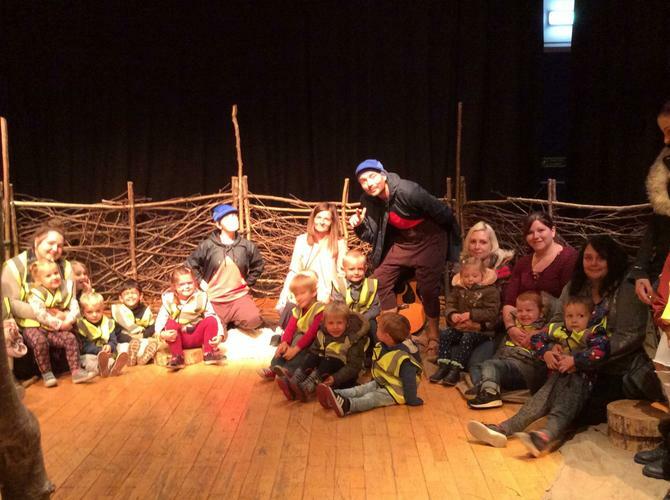 We held a play workshop for our Squirrels and Acorns families. 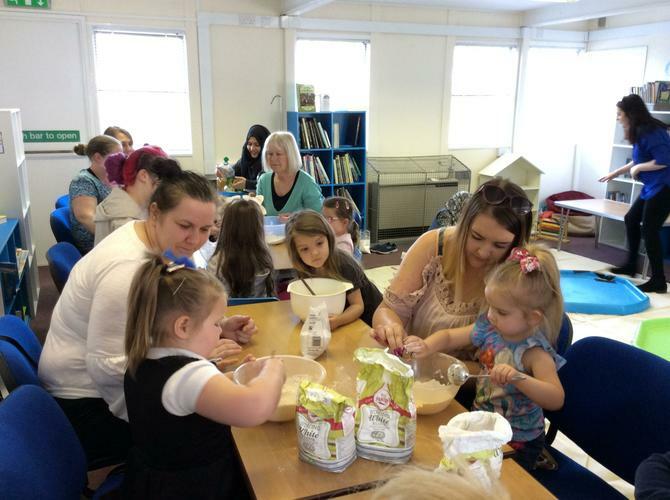 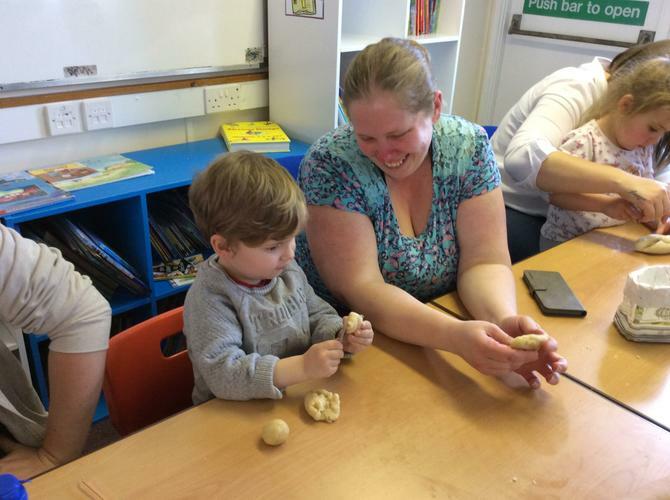 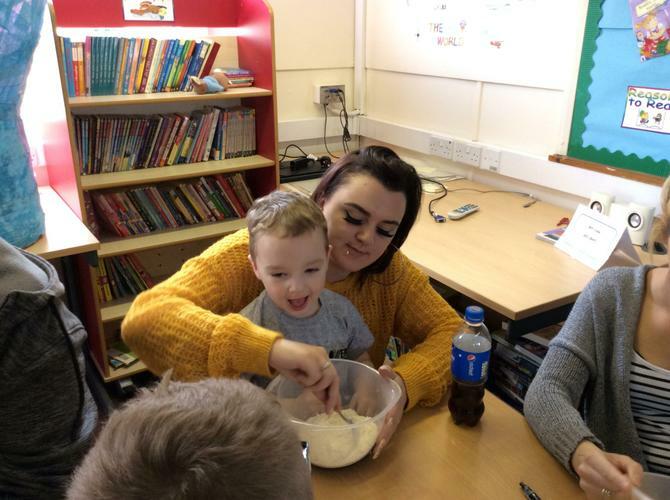 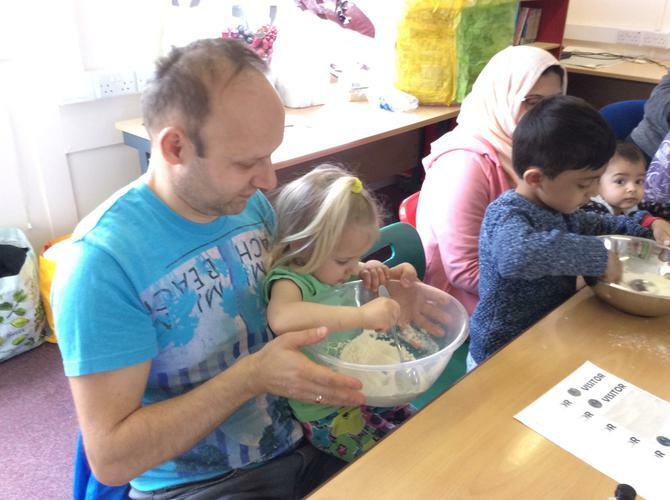 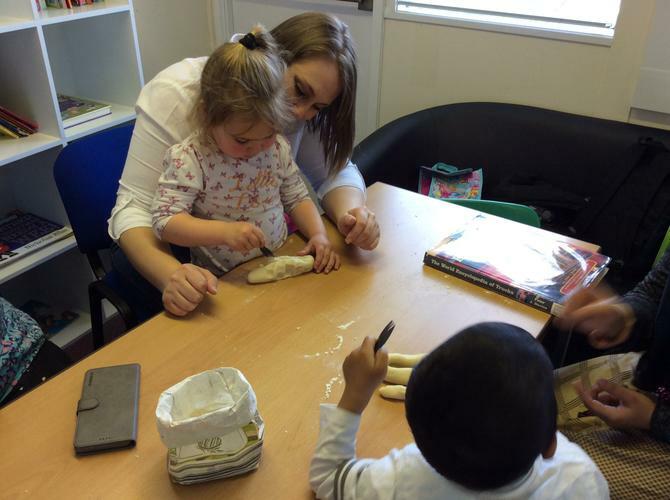 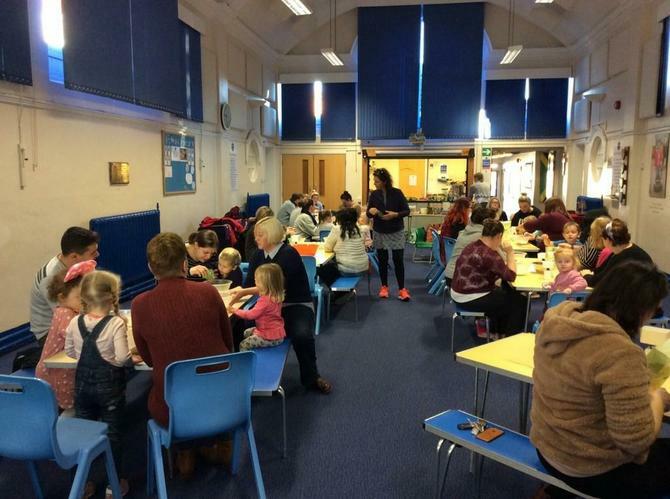 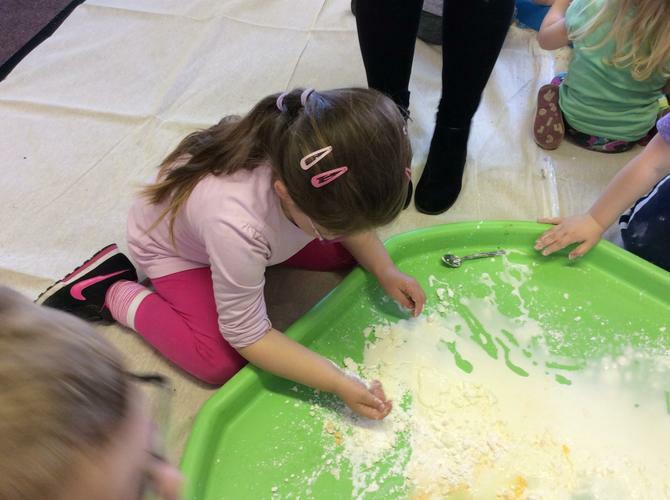 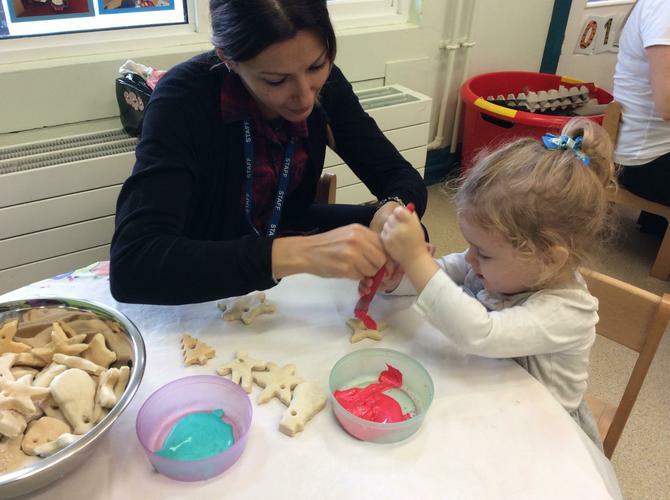 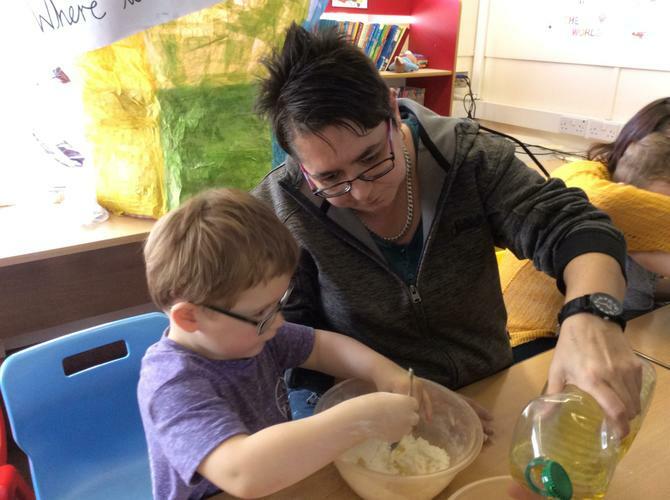 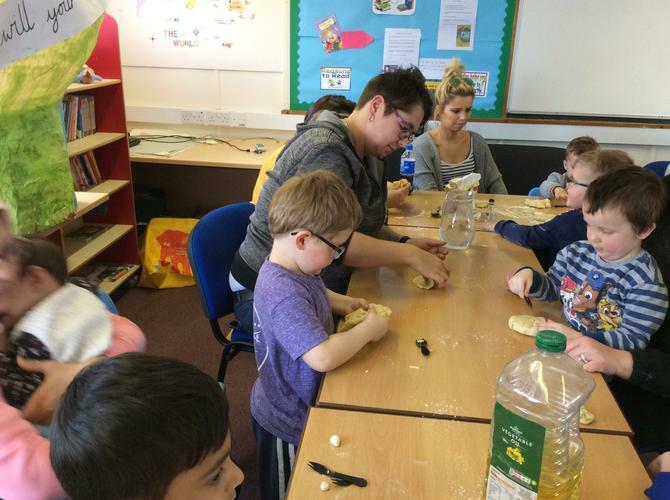 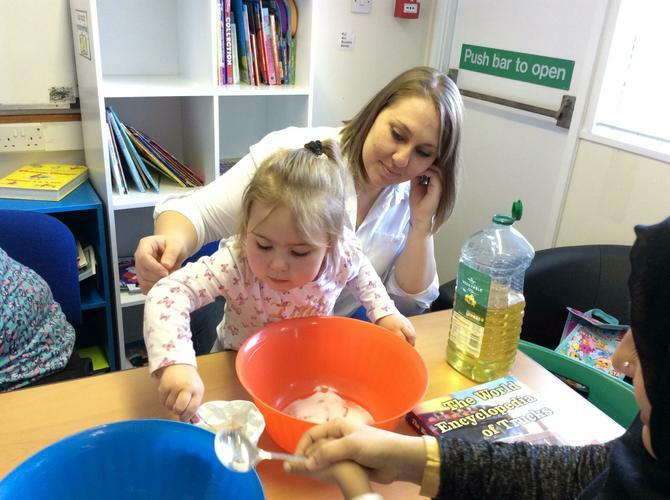 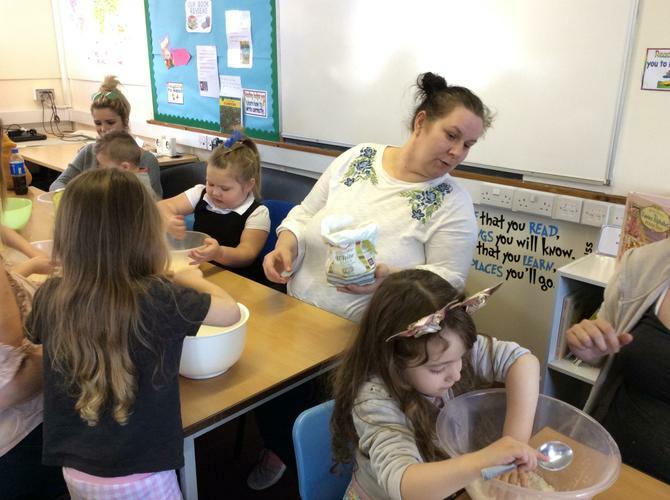 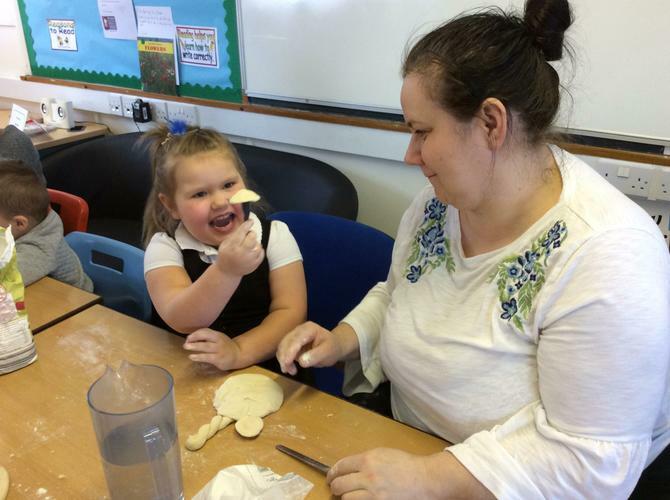 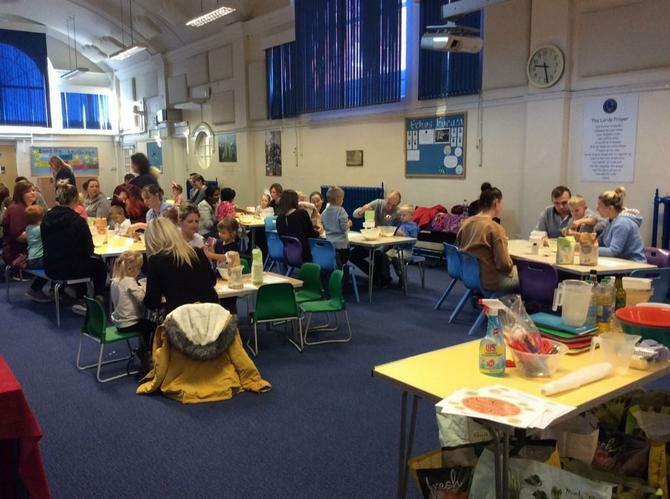 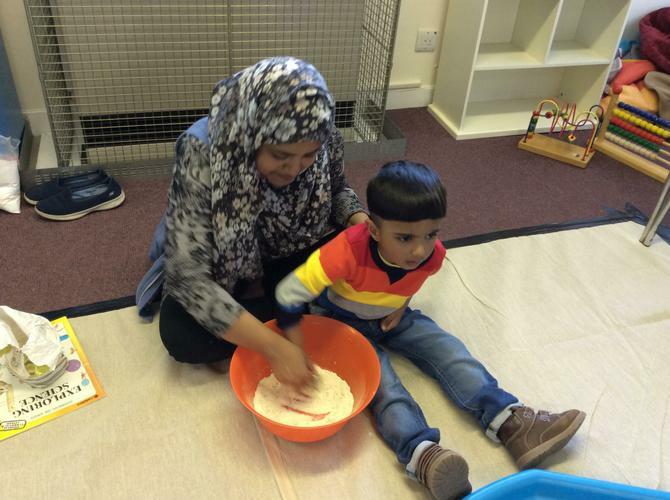 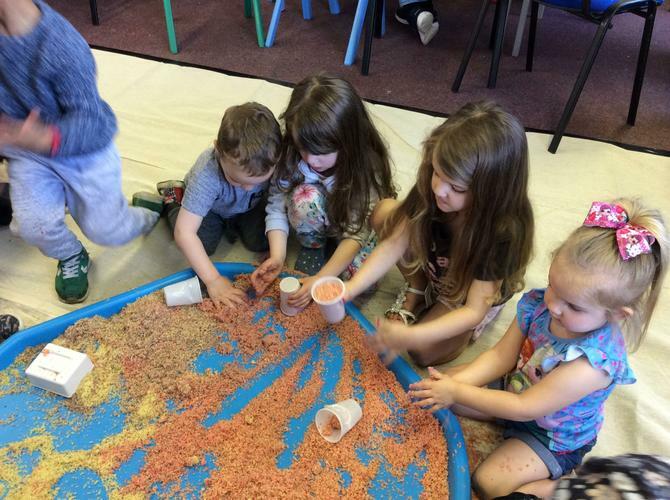 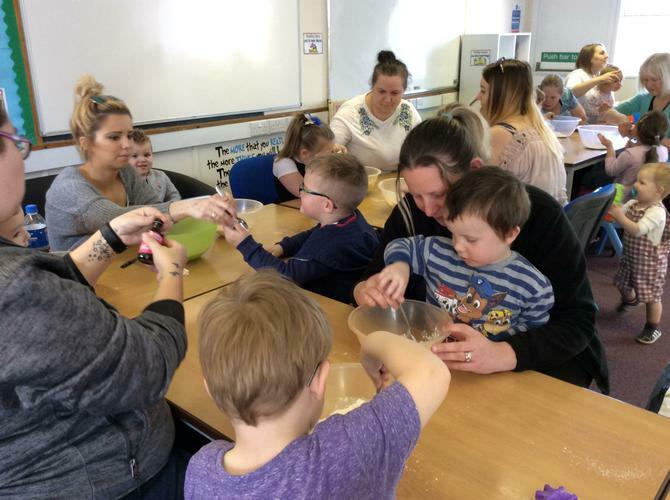 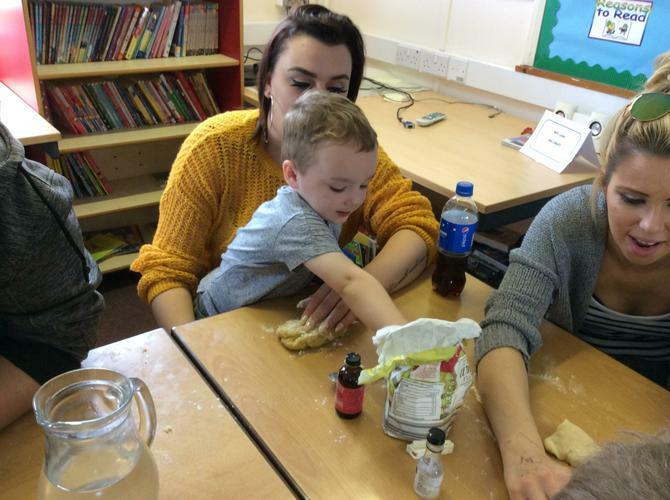 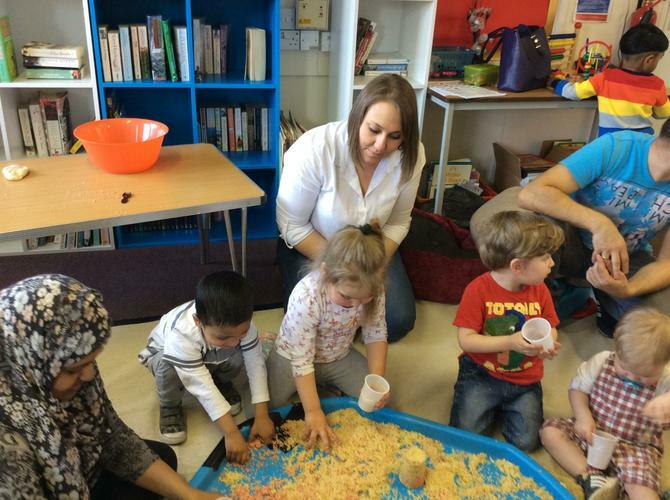 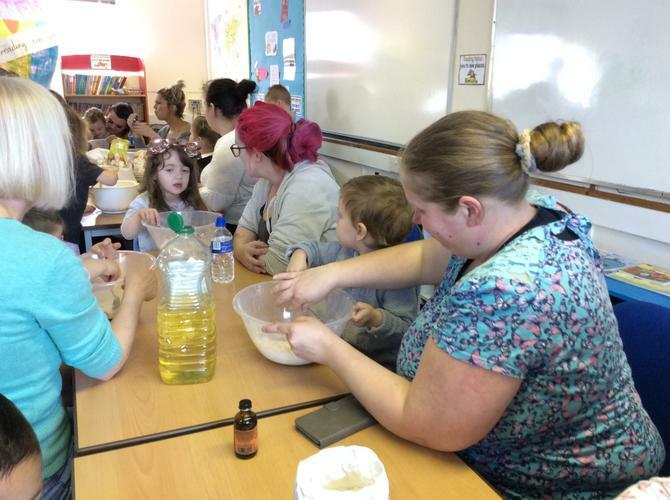 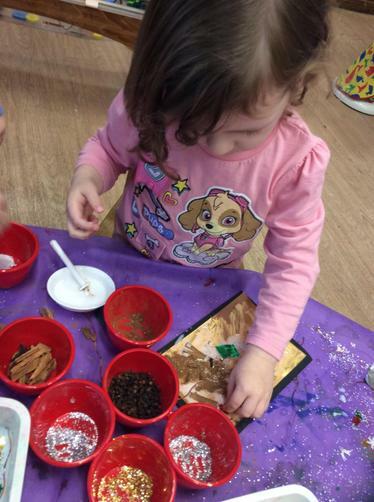 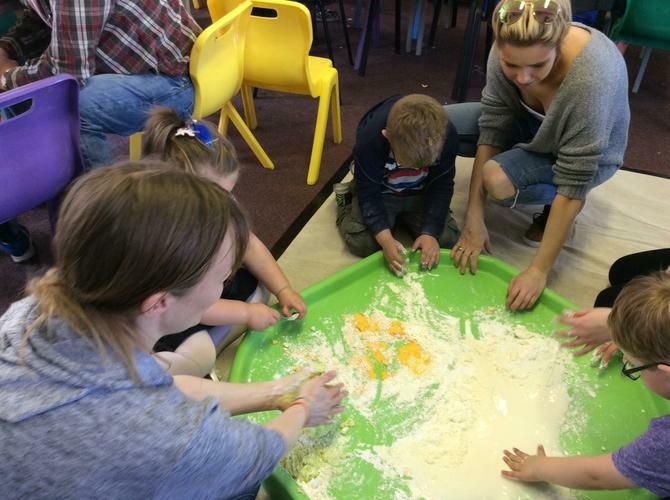 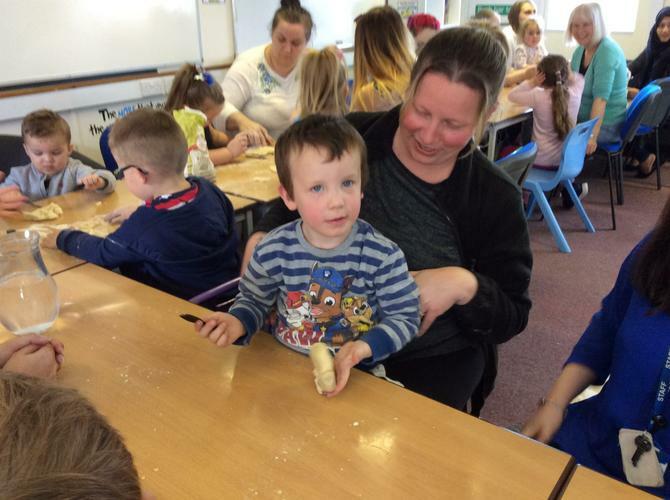 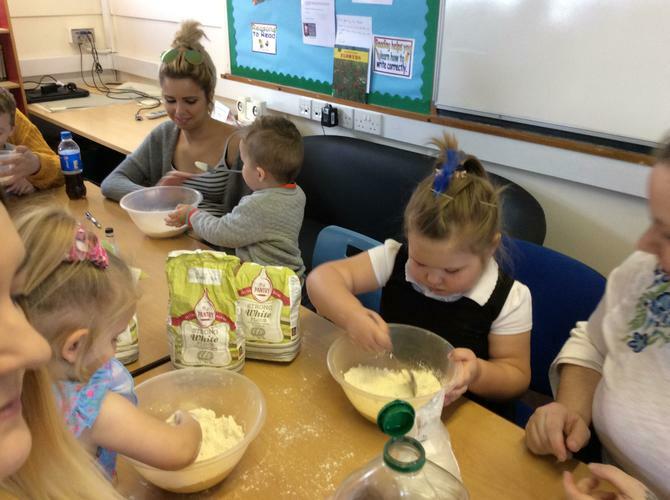 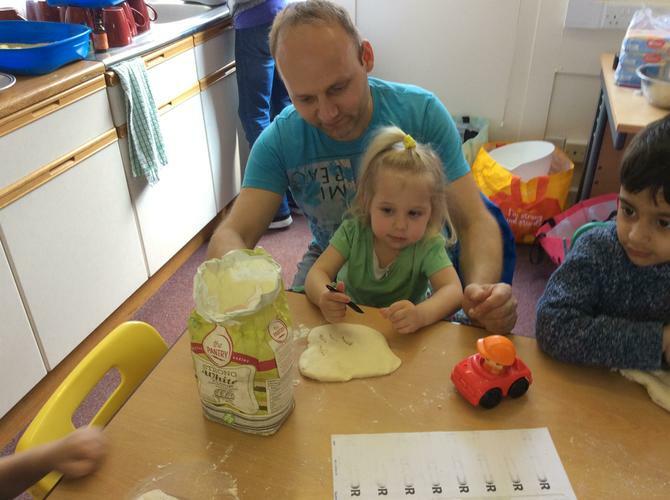 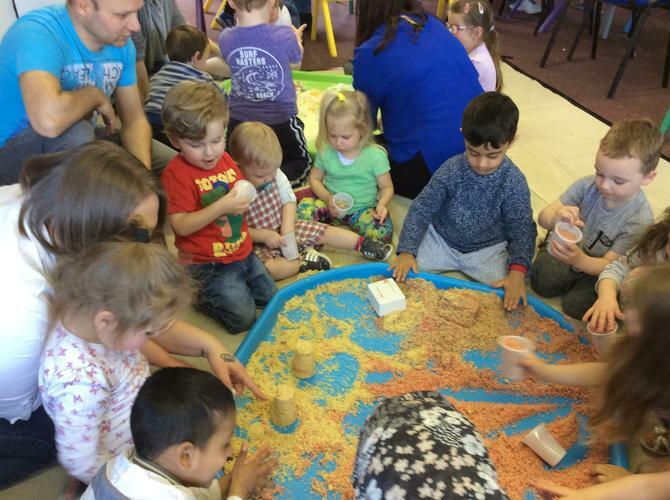 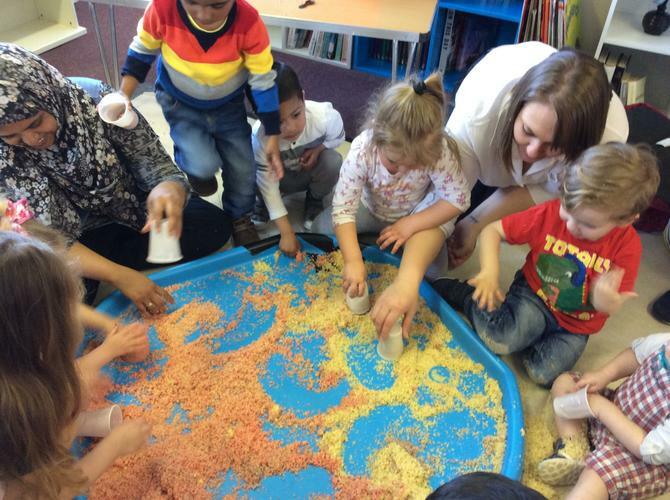 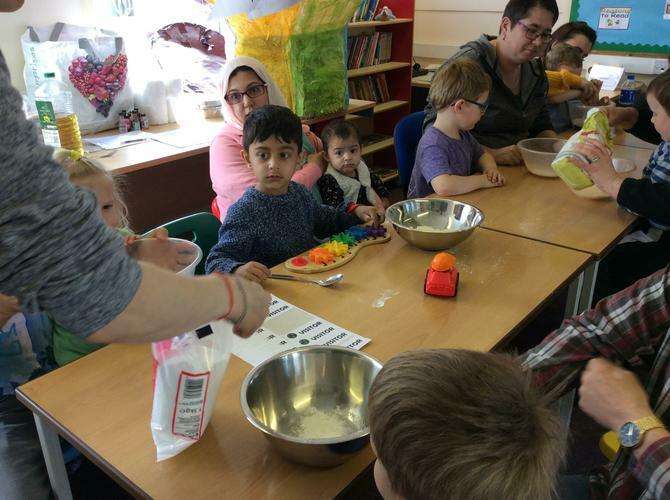 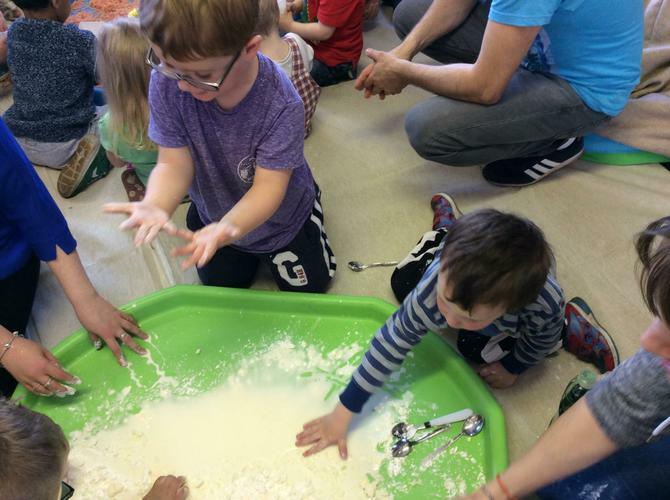 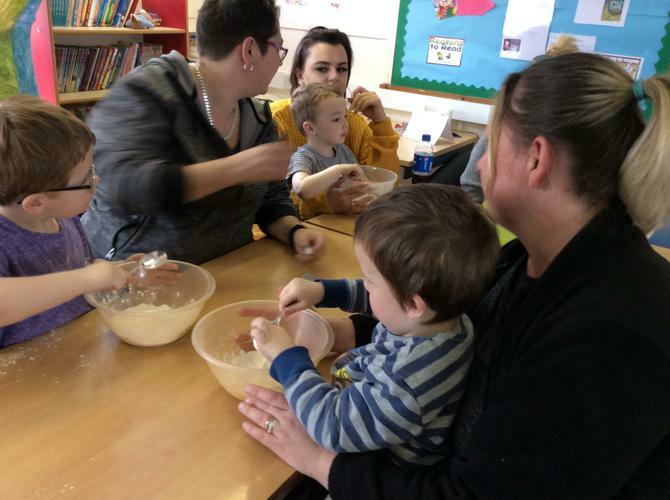 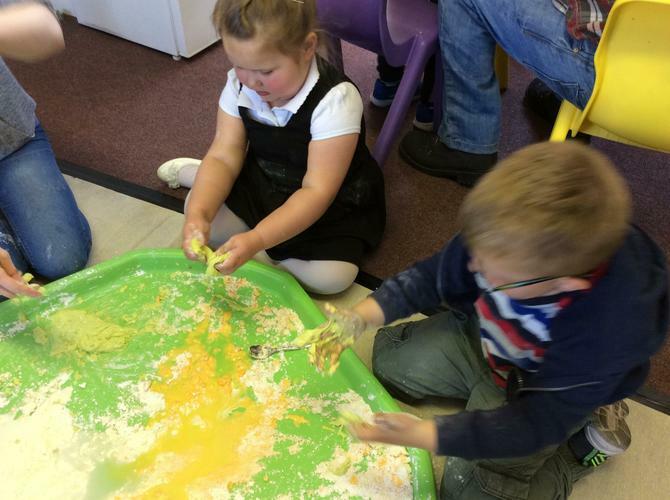 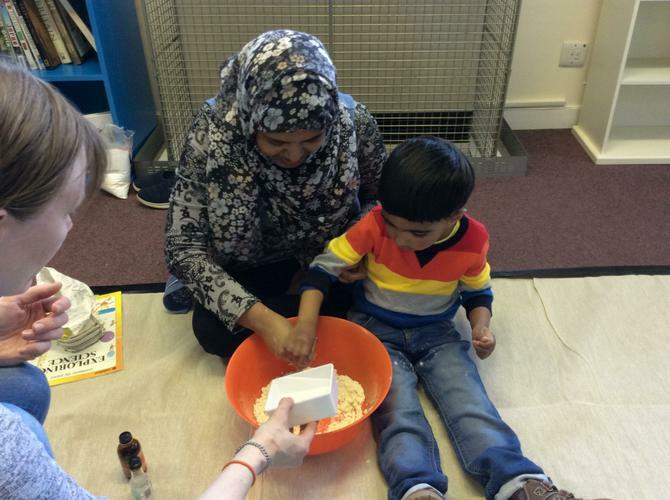 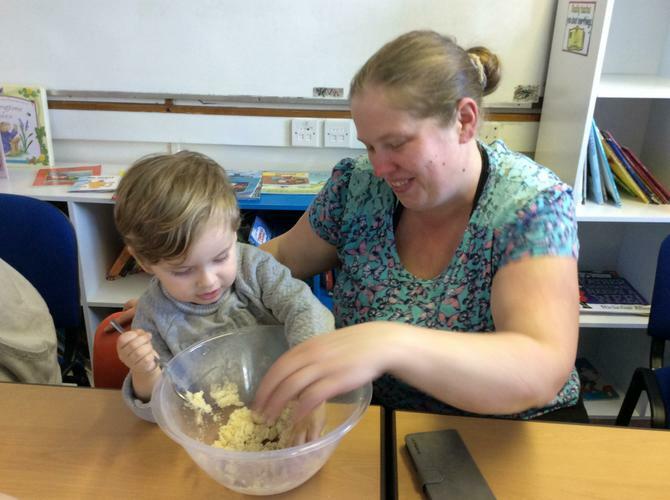 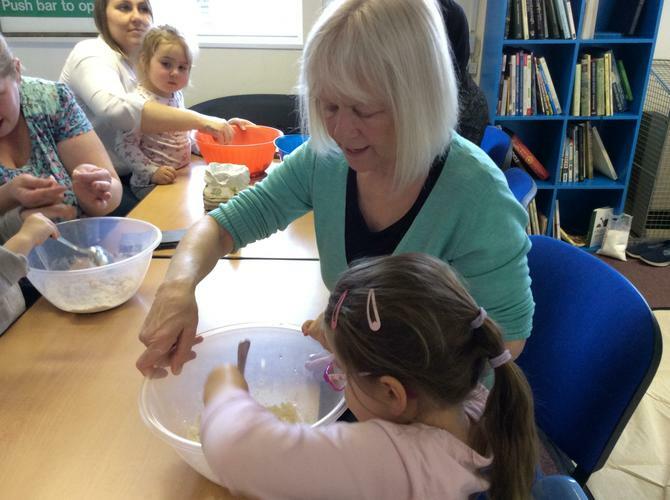 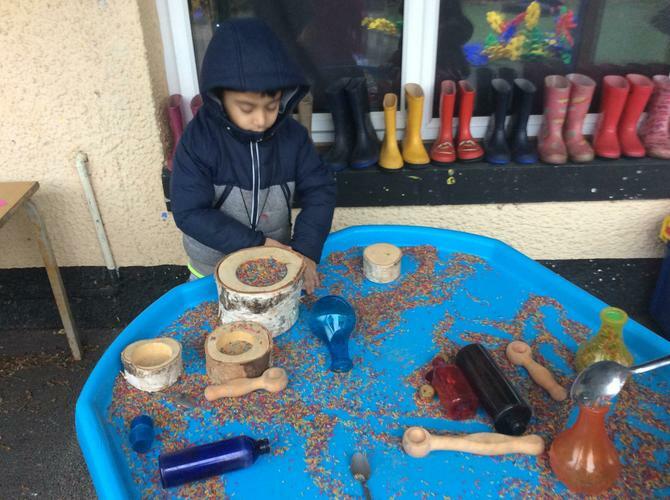 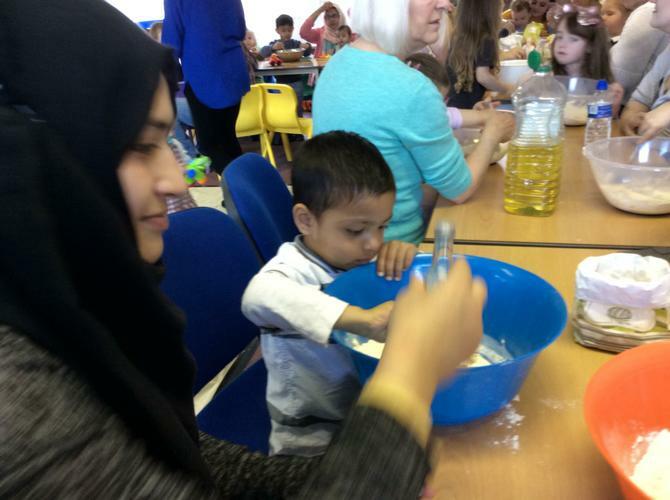 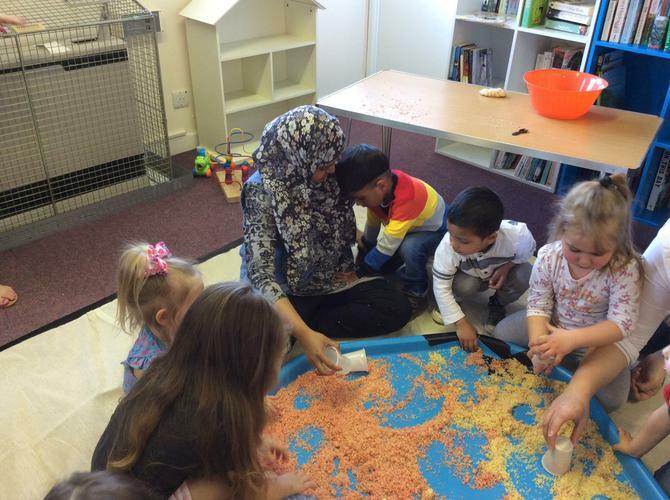 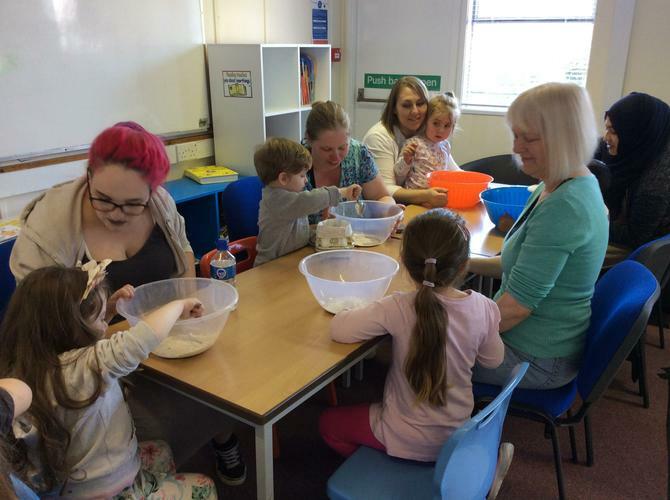 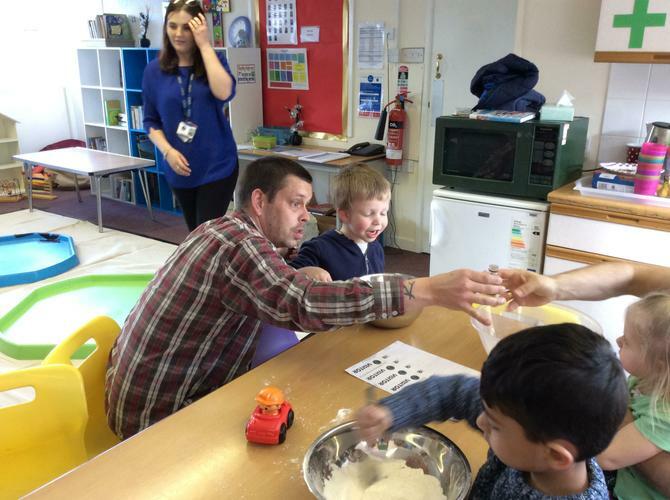 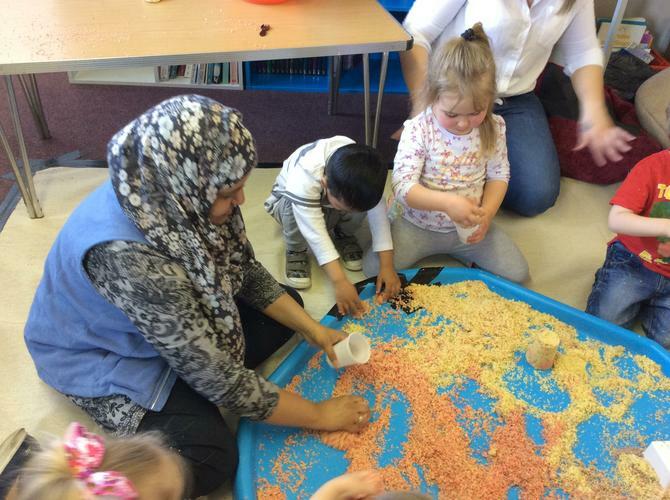 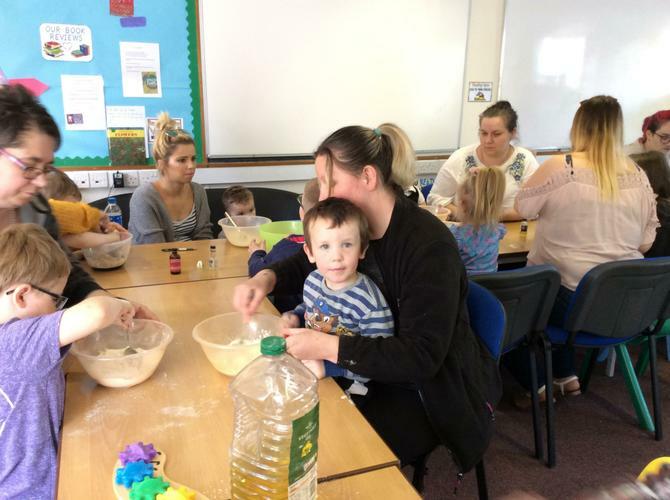 Parents joined their children in making playdough together and playing with the cornflour and rice sensory trays. 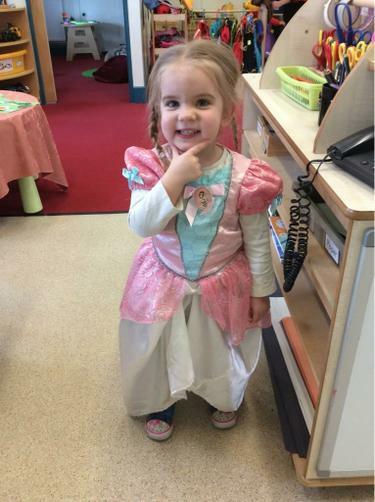 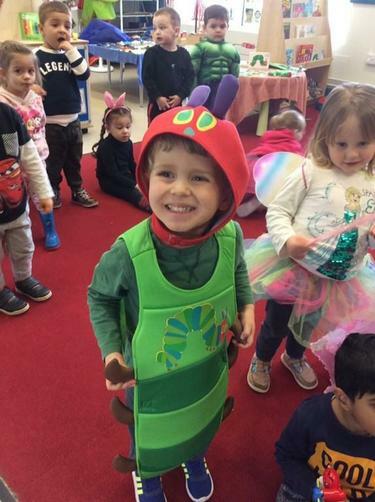 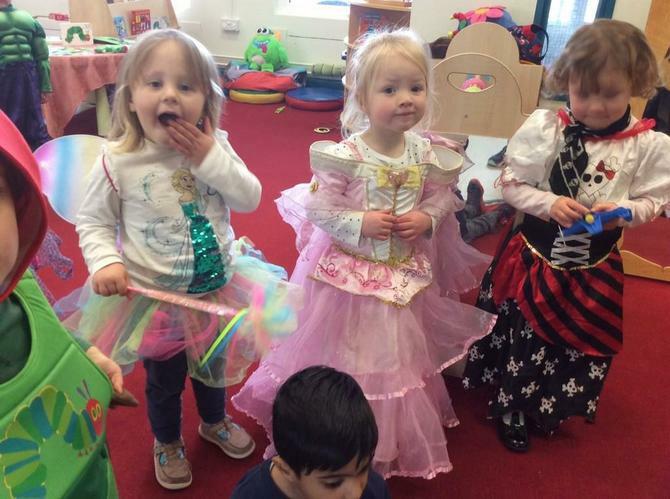 We have been celebrating World Book Day in Nursery! 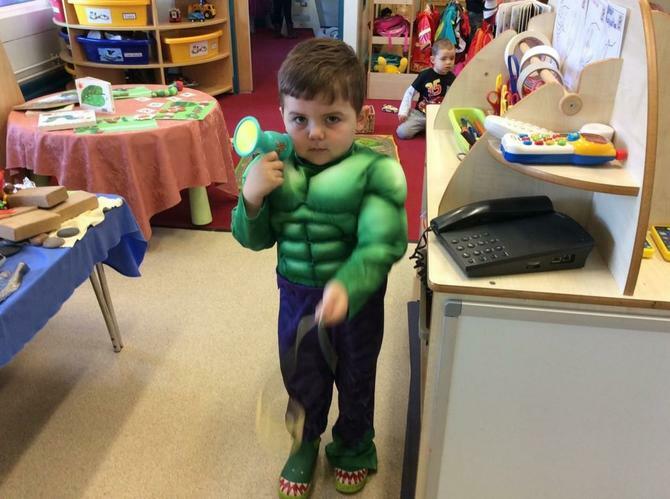 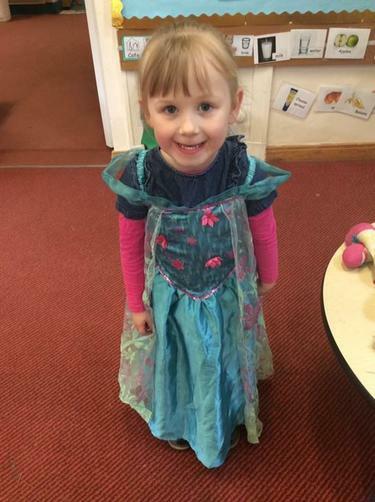 We came in to Nursery in dressing up clothes, some of us dressed as our favourite book character. 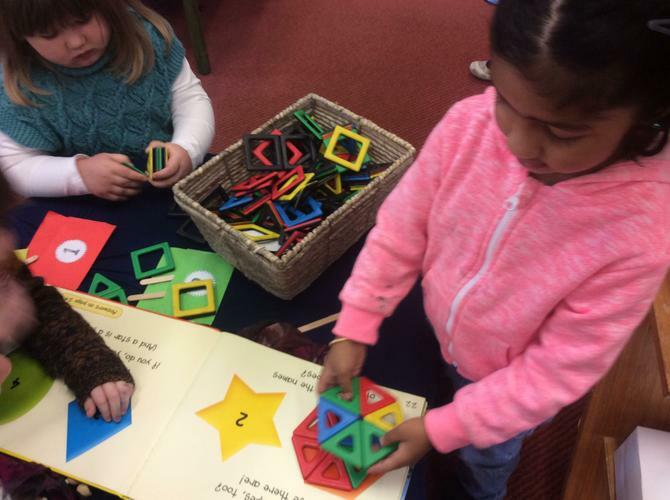 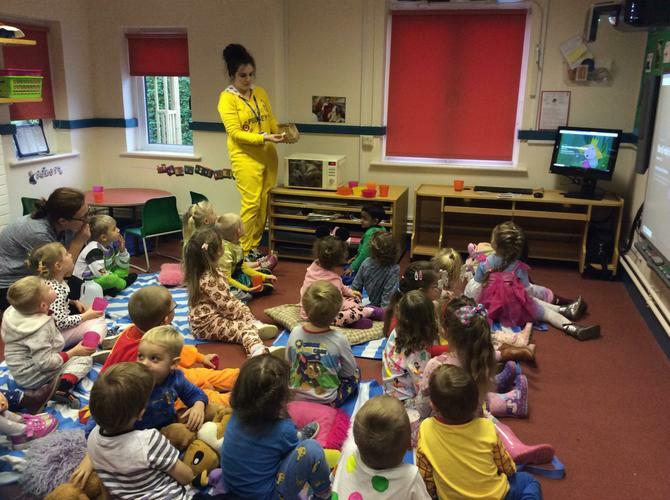 We love sharing books every day but today we had some special story time. 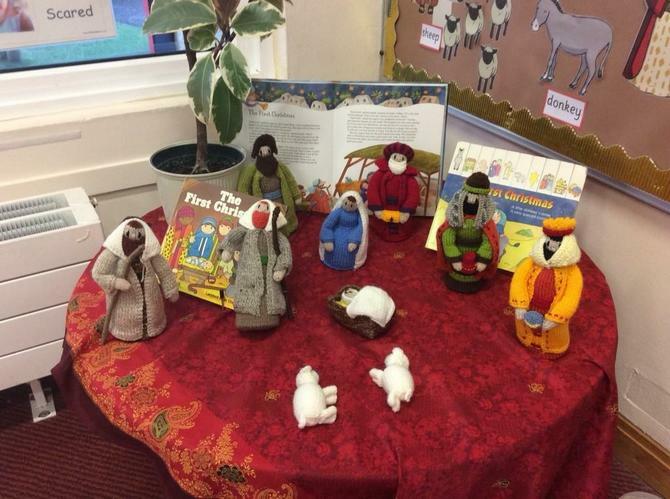 Mrs Jewhurst used her special storytelling figures to tell the story of Zacchaeus from the Bible. 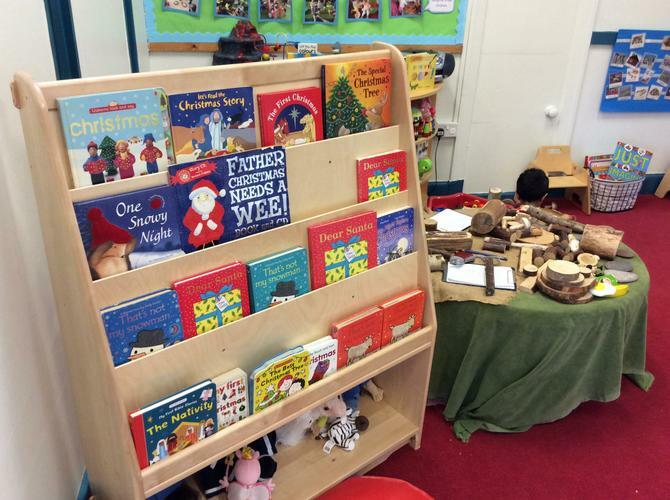 In Squirrels Mrs Coles shared the Ten in the Bed story sack with us - we each had an animal to look after when it had fallen out of the bed! 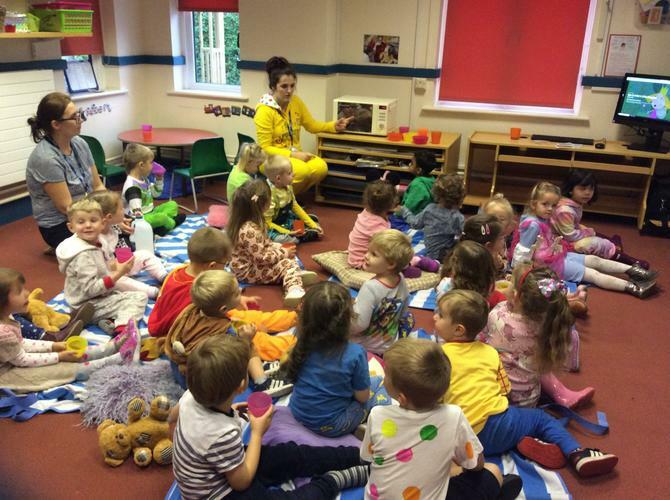 In Acorns the children have been sharing the Elmer story sack, hearing all about how Elmer was different from the other elephants but that is what made him special. 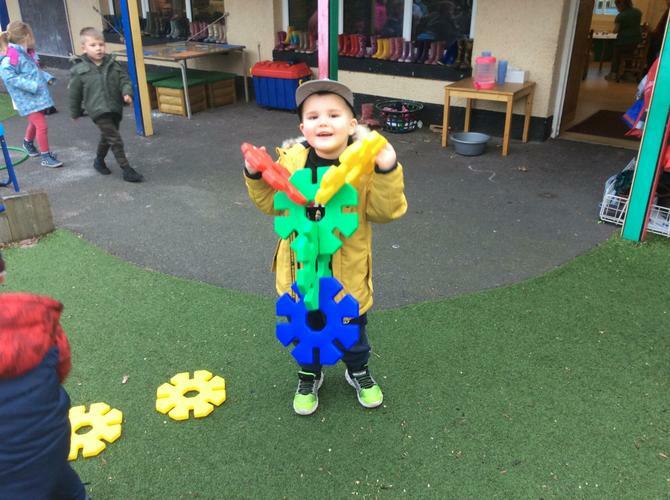 Our STC signs for the week are "same" , "different", and "elephant" ! 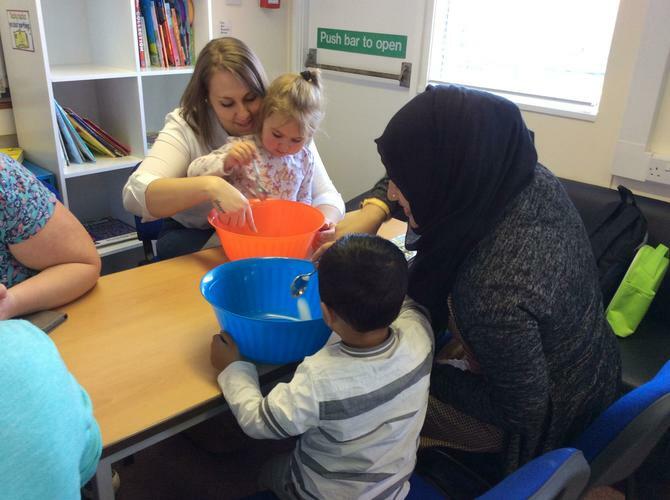 Hearing stories in different ways helps to develop our listening, understanding and communication skills. 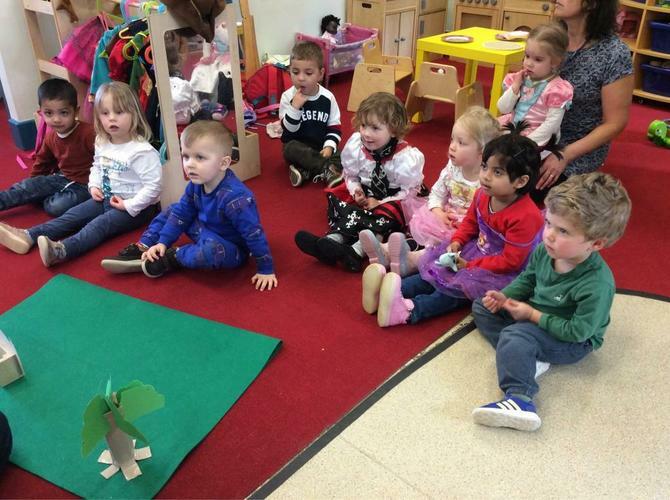 A new term in Squirrels! 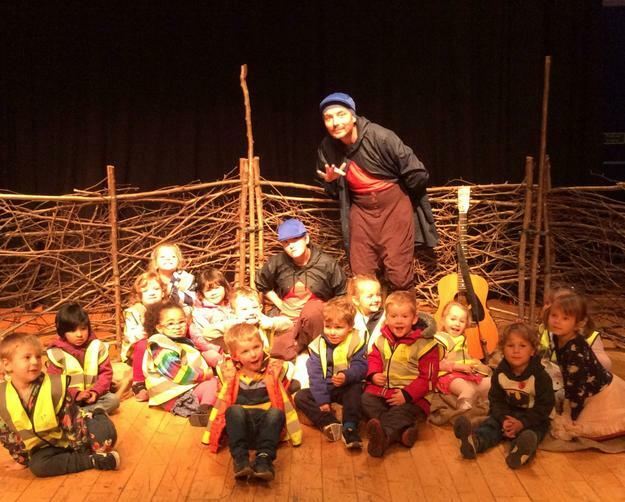 Happy New Year from everyone in Squirrels! 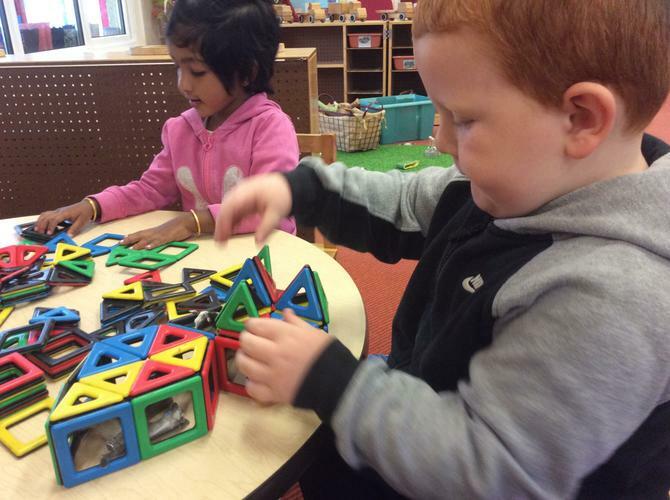 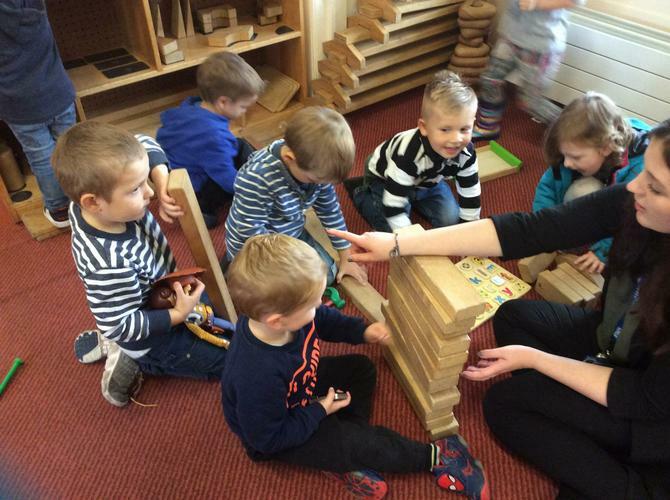 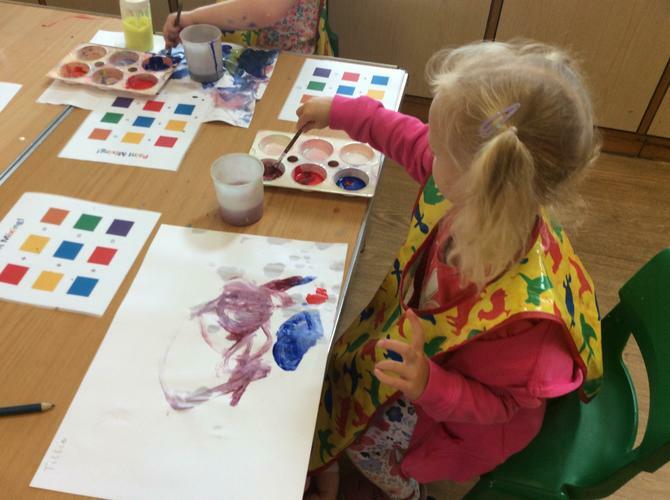 Already this term we have been doing lots of fun activities. 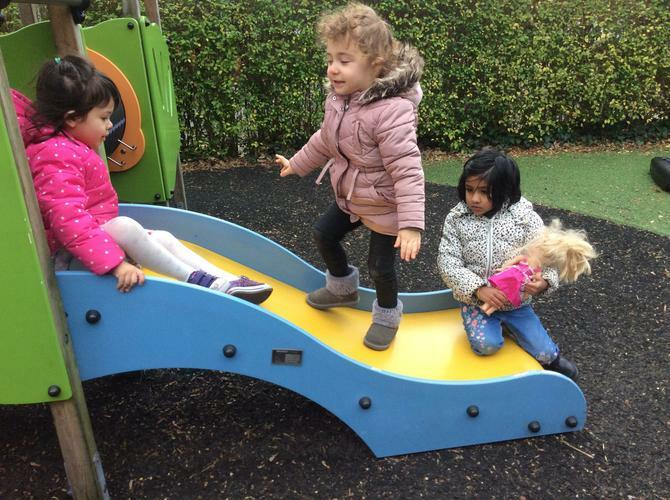 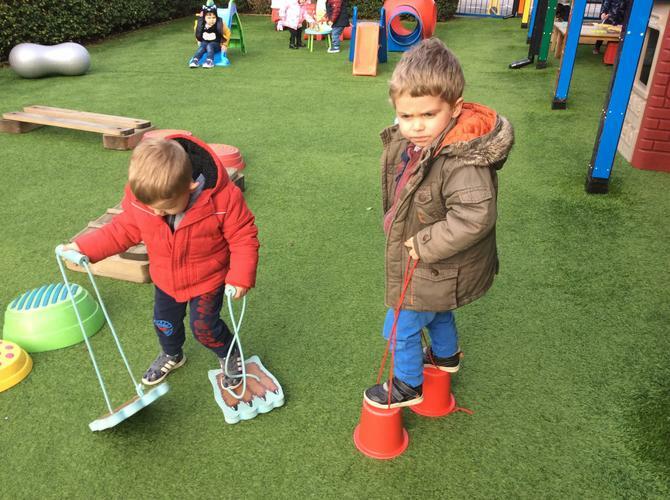 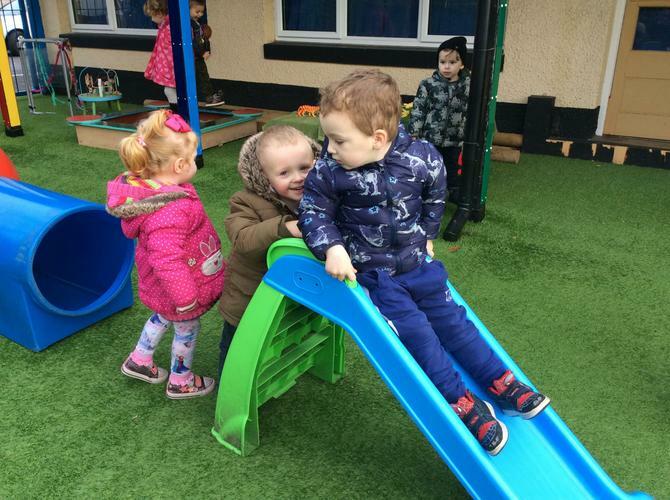 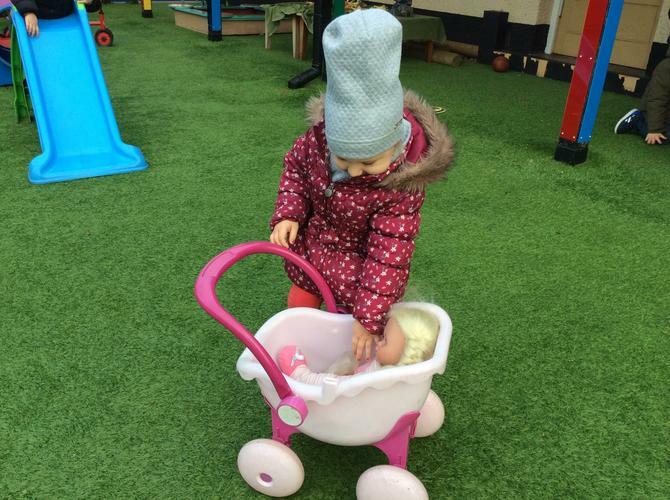 Despite the cold weather we have been wrapping up warm and developing our gross motor skills on the play equipment. 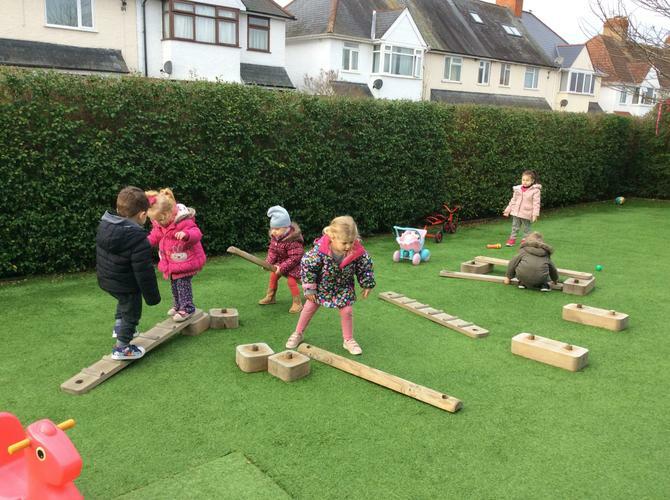 We really enjoy playing outside together and especially enjoy running races! 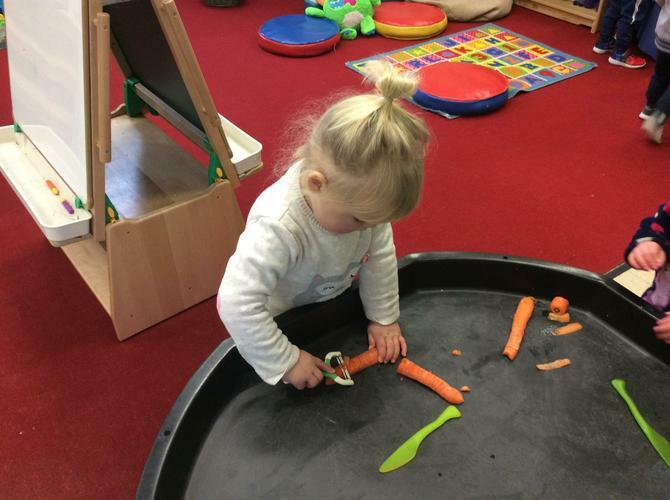 Indoors we have been developing our fine motor skills and learning how to use tools safely by peeling a chopping vegetables and fruit. 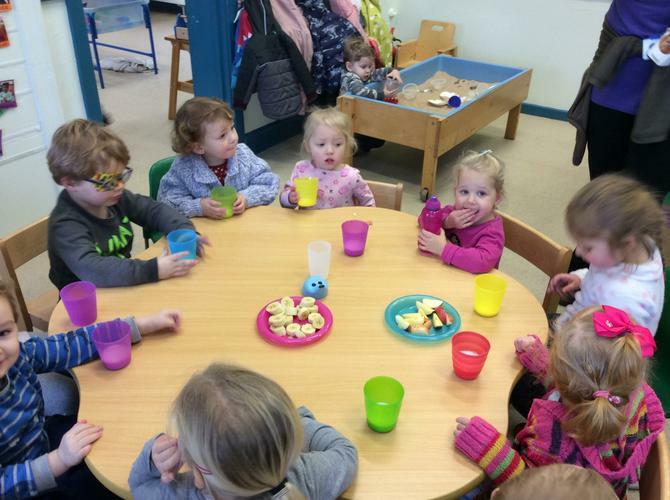 We've been enjoying fruit as a yummy snack every day as well! 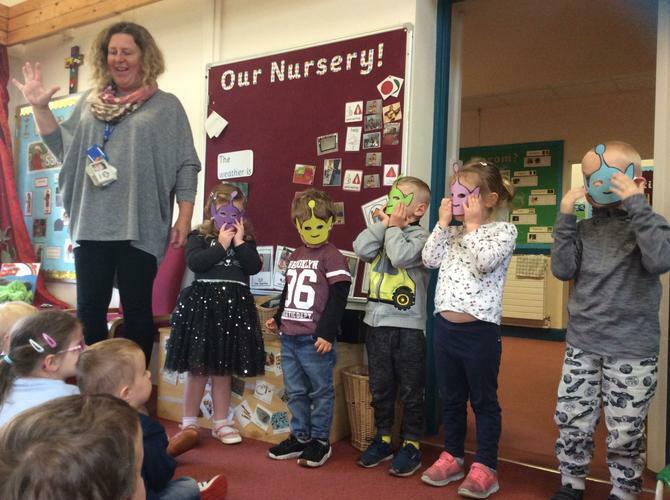 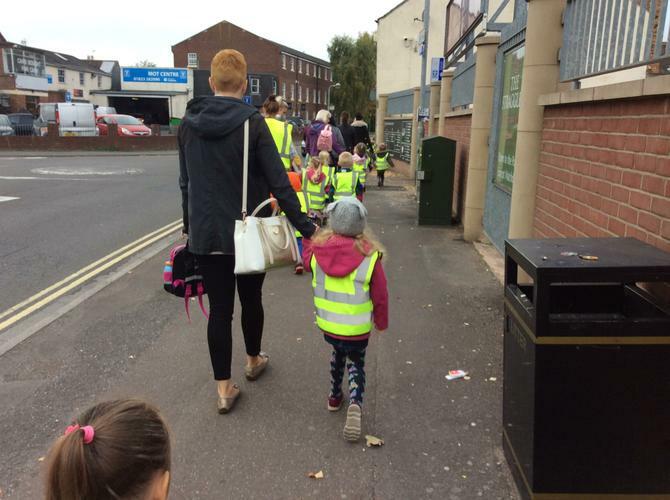 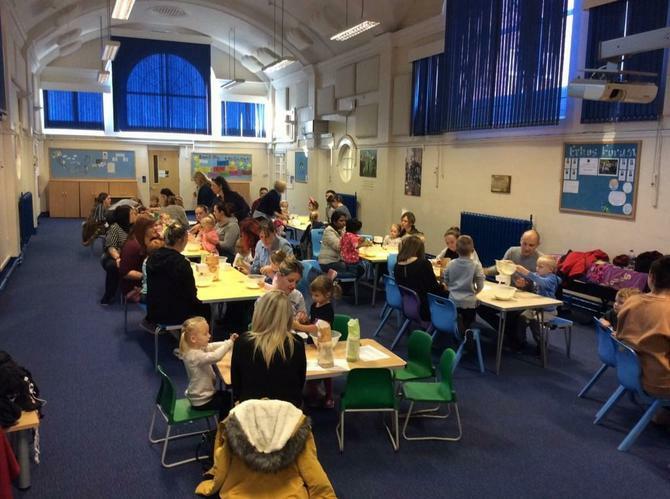 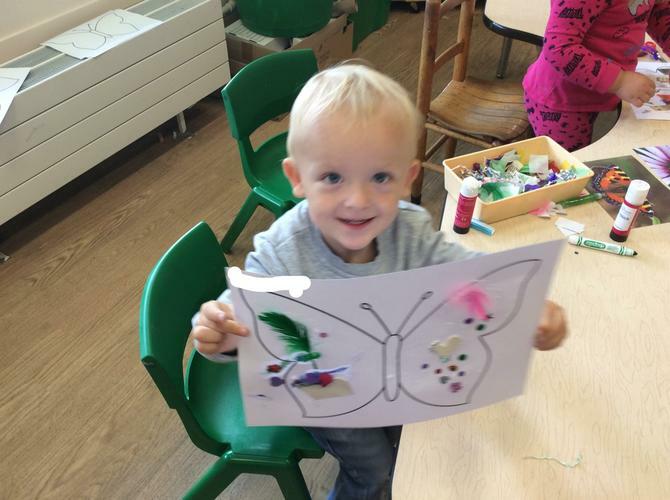 A new term in Acorns! 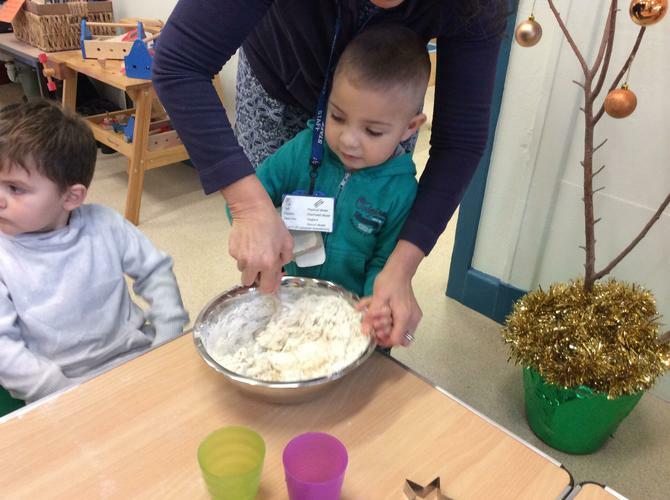 Happy New Year from everyone in Acorns! 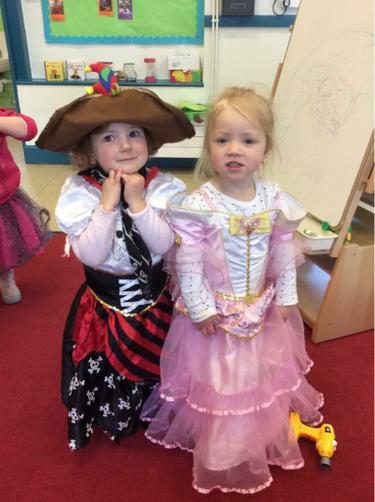 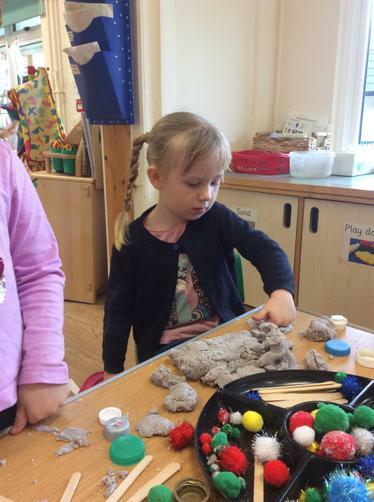 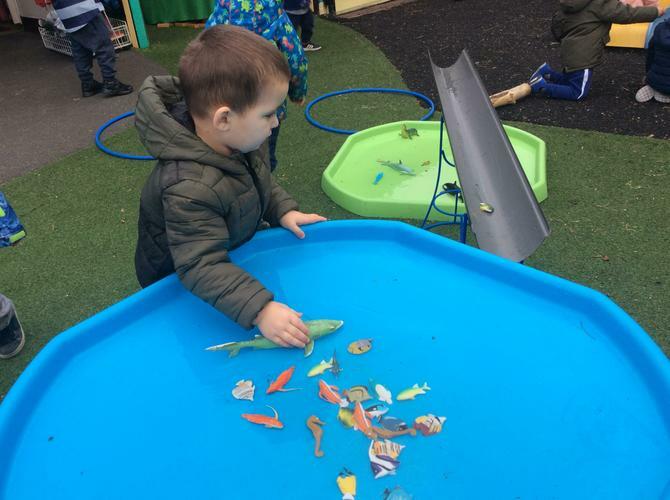 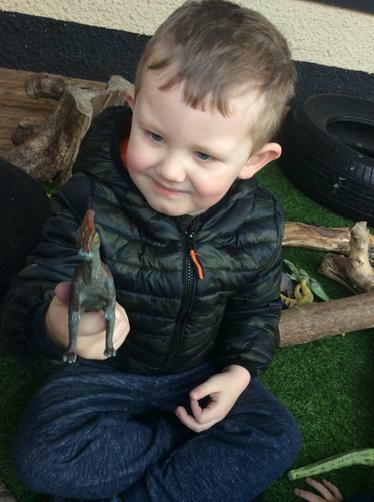 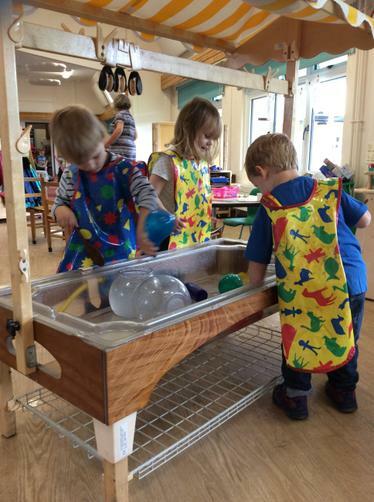 So far his term we have been focusing on a pirate theme, with lots of digging for treasure in our sandpit and playing in our pirate costumes. 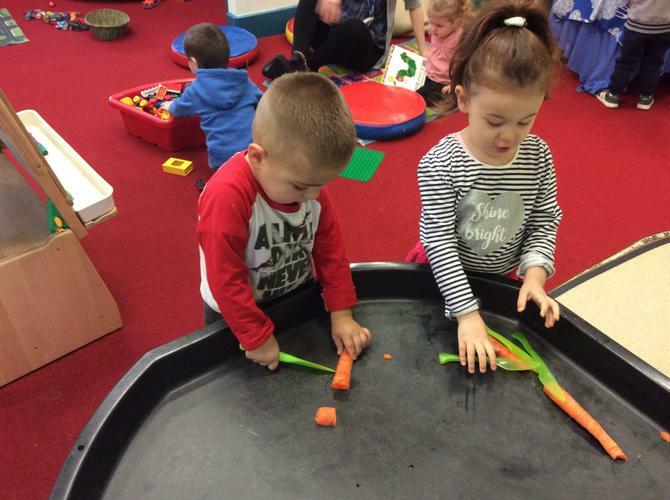 We have also been doing activities to work on our fine motor skills, which help make our wrists and fingers strong ready to start writing. 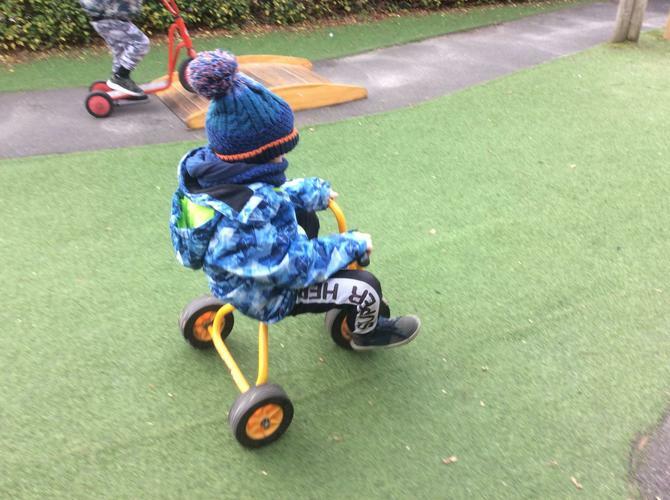 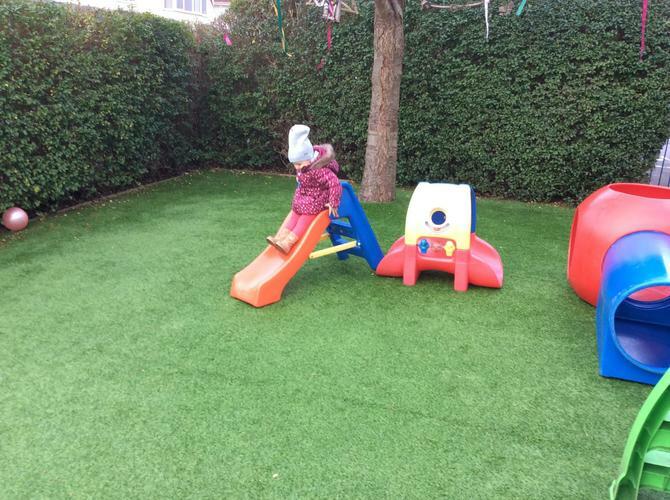 Despite the cold weather, we have been wrapping up warm and having fun in our garden with the play equipment and bikes. 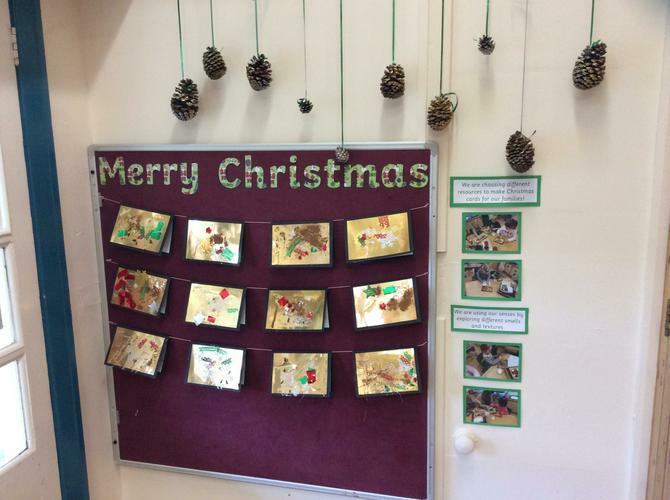 The children in Squirrels have been getting ready for Christmas! 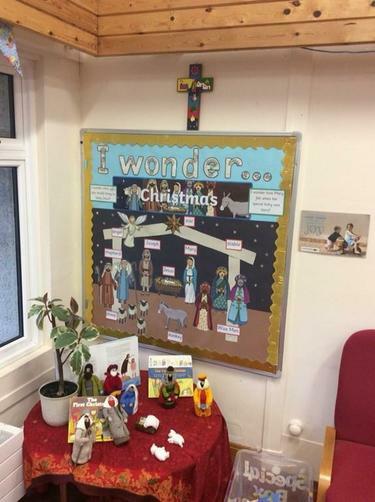 We have lots of lovely decorations up in our room, and some Christmassy books to read. 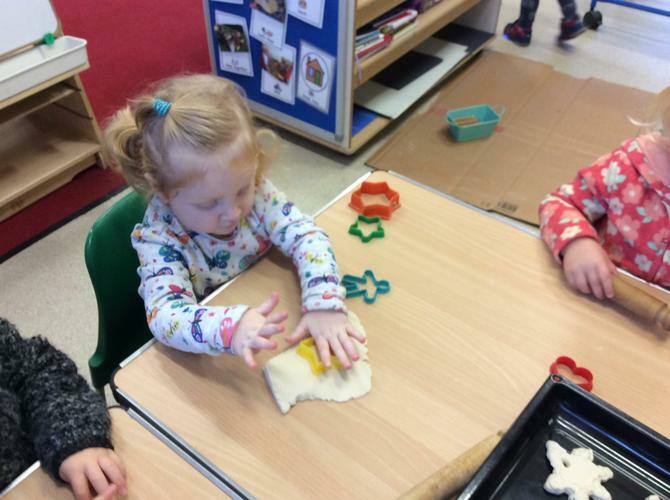 We have also had lots of fun making and painting salt dough decorations to take home. 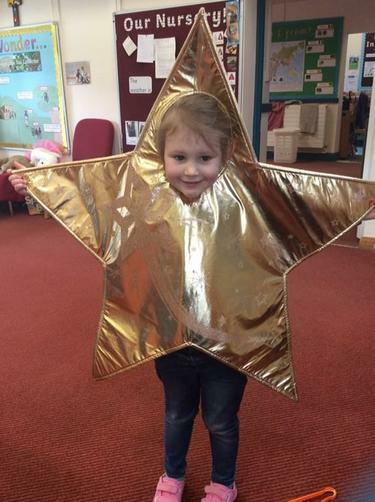 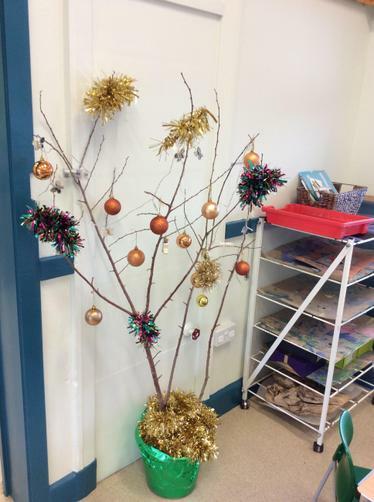 The Acorns children have been getting ready for Christmas! 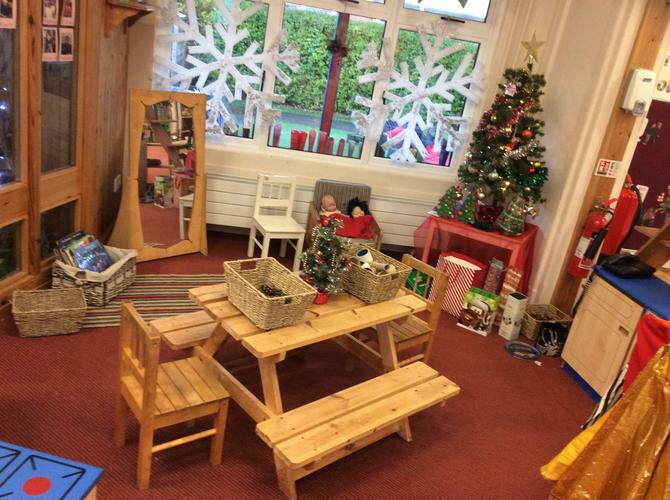 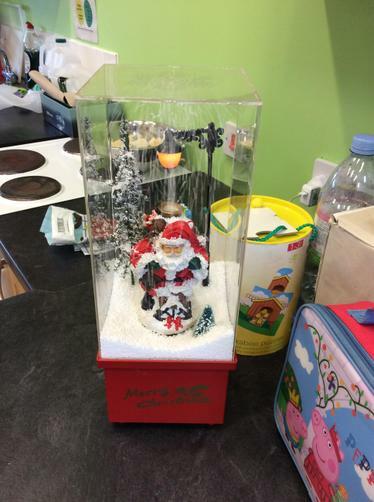 We have lovely Christmas decorations and displays around our room and in our role play area. 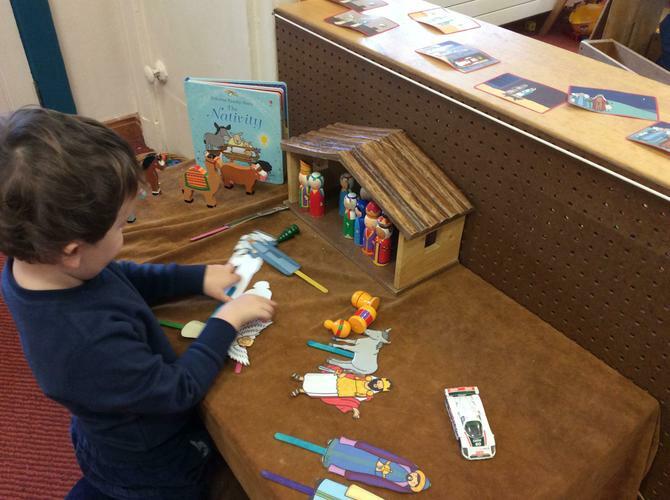 We have been making Christmas cards using lots of multi-sensory decorations and spices, and have enjoyed retelling the Christmas story using our nativity sets. 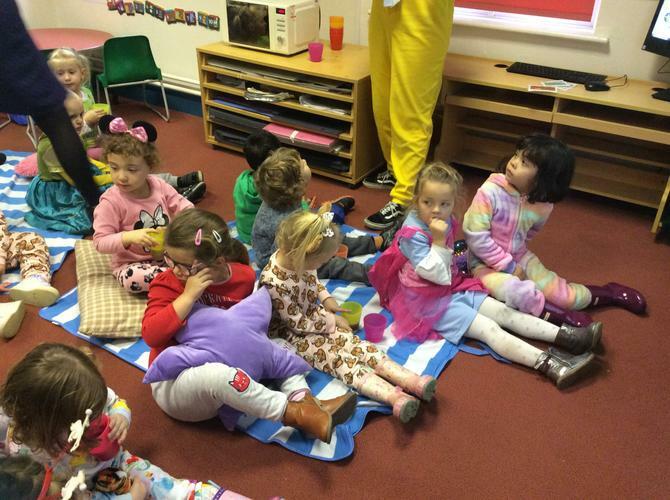 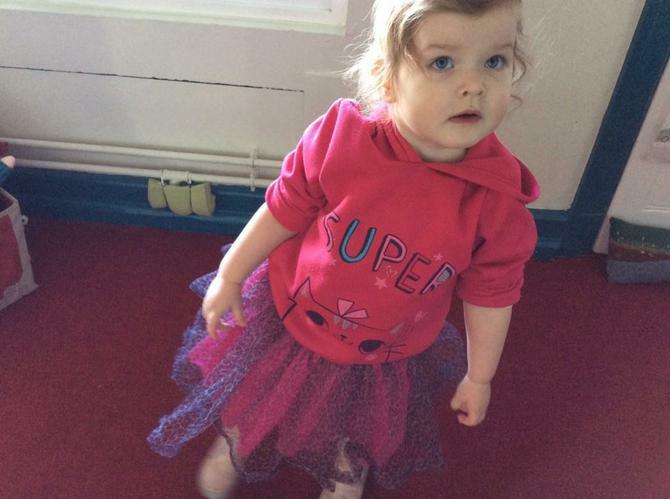 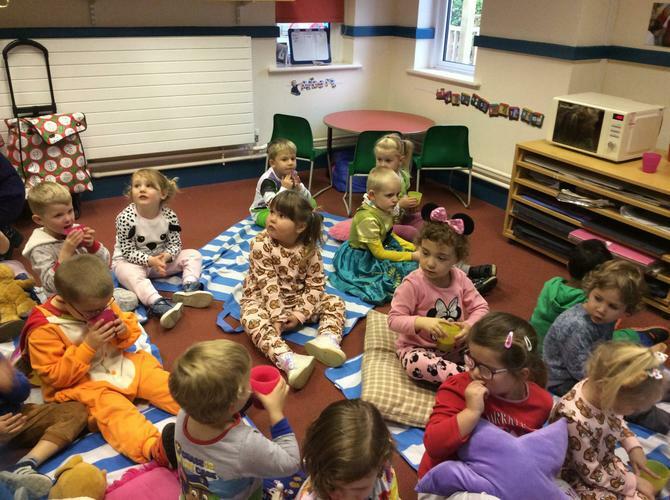 On Children in Need day we came to Nursery in spotty clothes or our pyjamas and onesies! 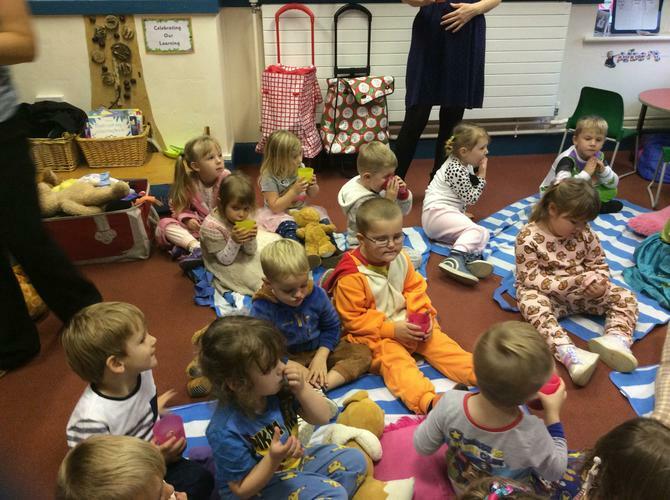 We looked at the CiN website and talked about why we needed to raise money. 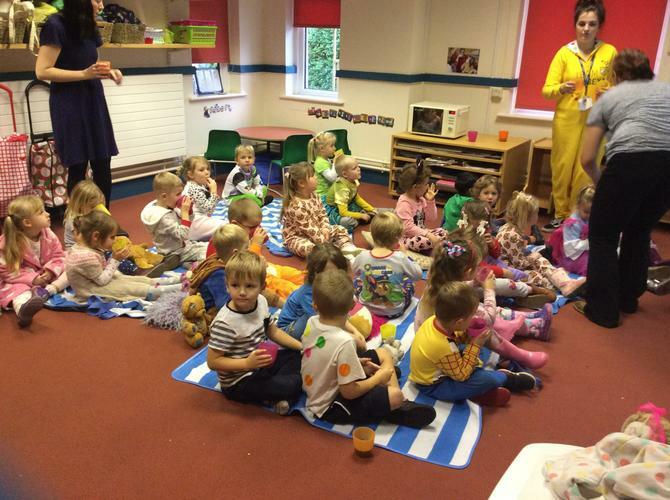 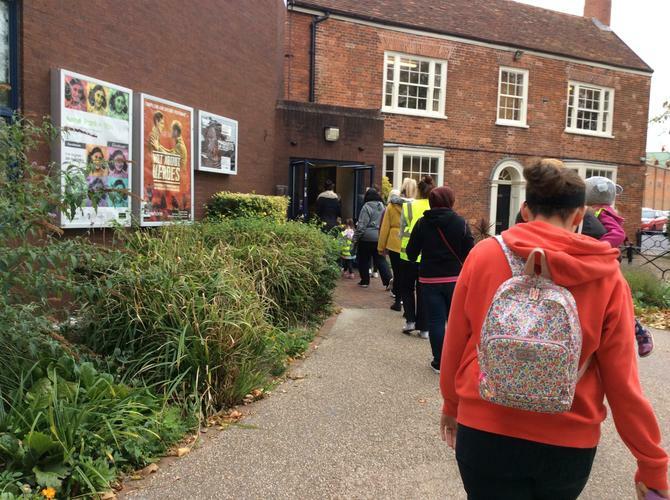 Then we had popcorn and hot chocolate and watched the Hey Duggee Pudsey Badge! 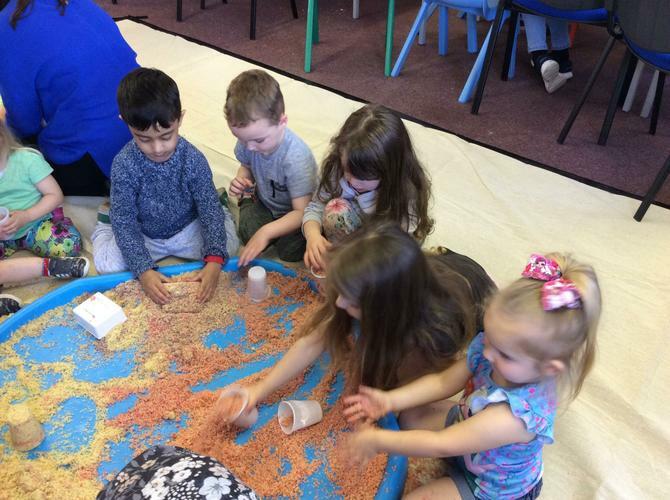 Events like Children in Need help us understand more about where we live and the lives of other children. 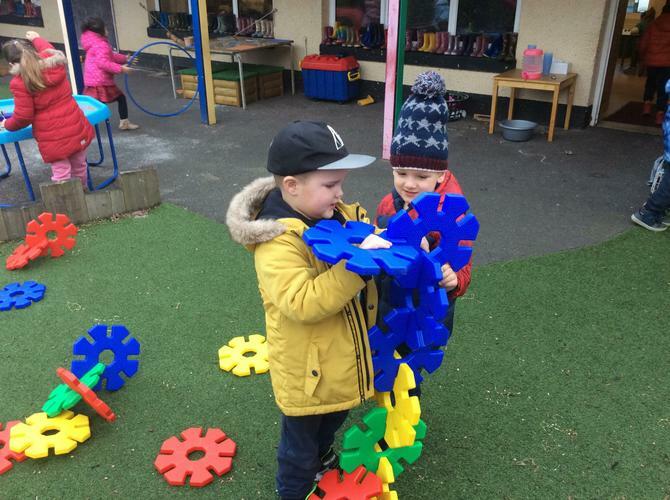 We learn that it is good to help each other. 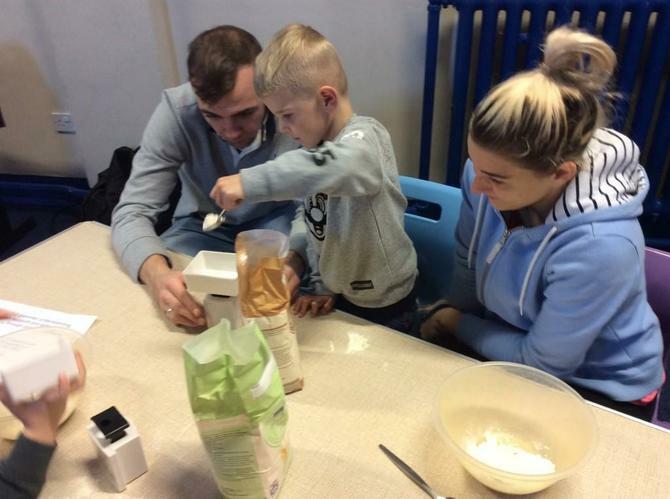 We invited our grown ups to come and take part in a cooking workshop with us, run by Somerset Skills and Learning. 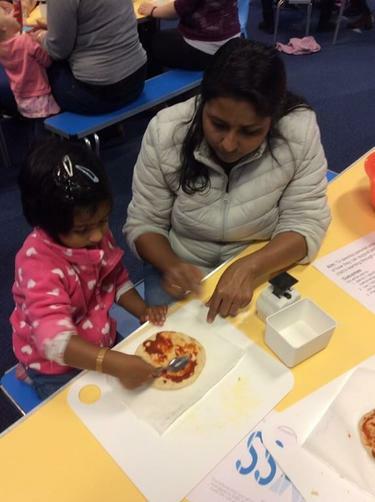 We made our own pizza, including the base, and put lots of different toppings on it. 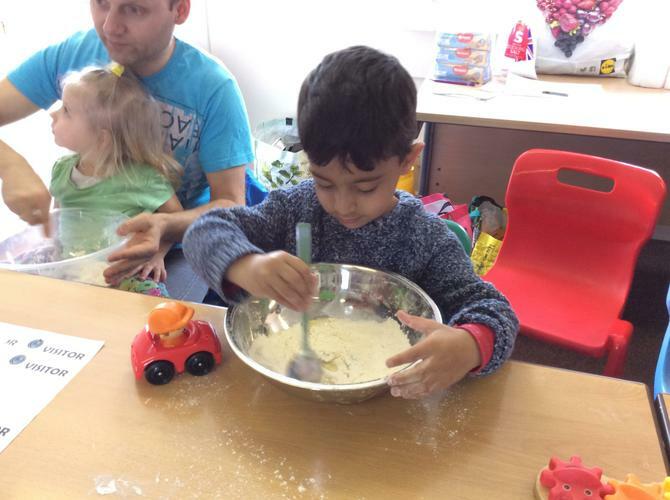 We also made fruit salad. 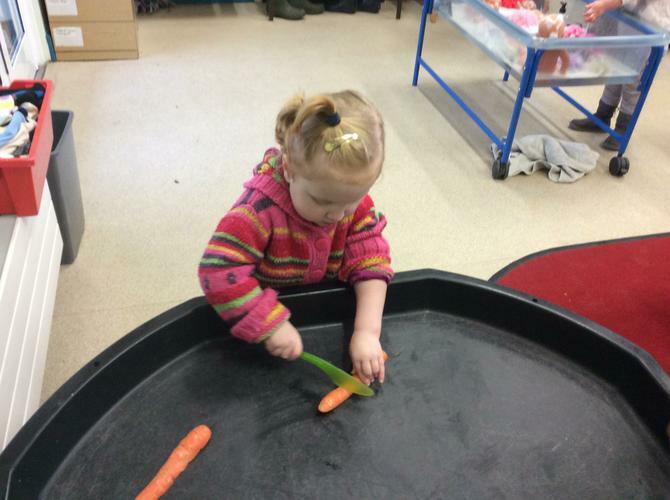 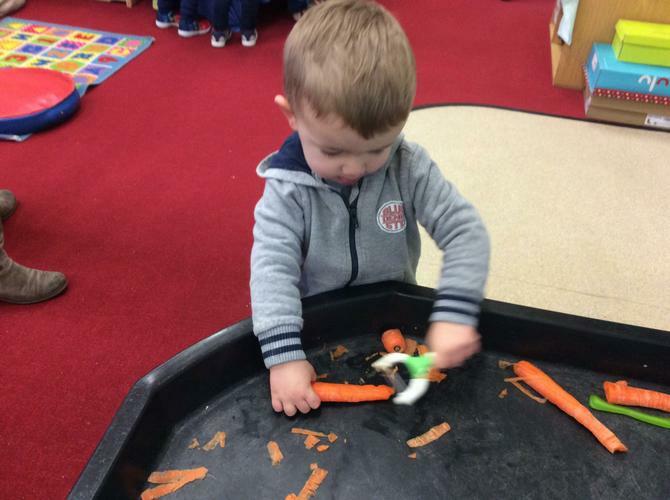 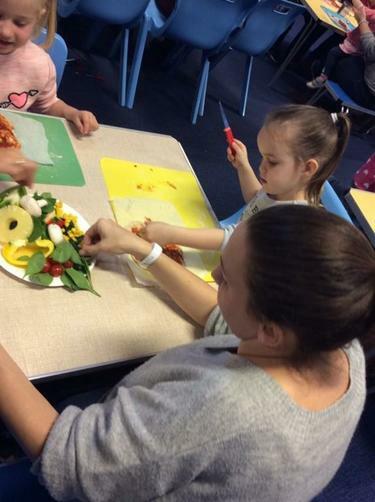 This activity helped to develop our fine motor skills as we were cutting up the vegetables and fruit. 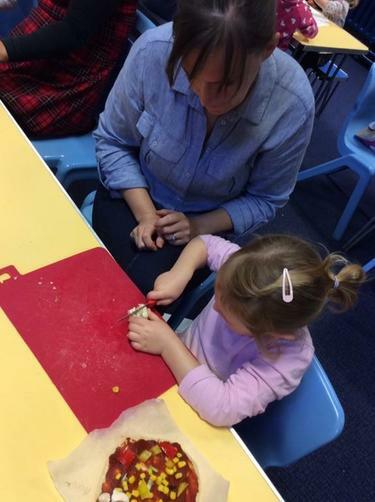 We had special knives to use and learnt the importance of cutting carefully, keeping our fingers out of the way. 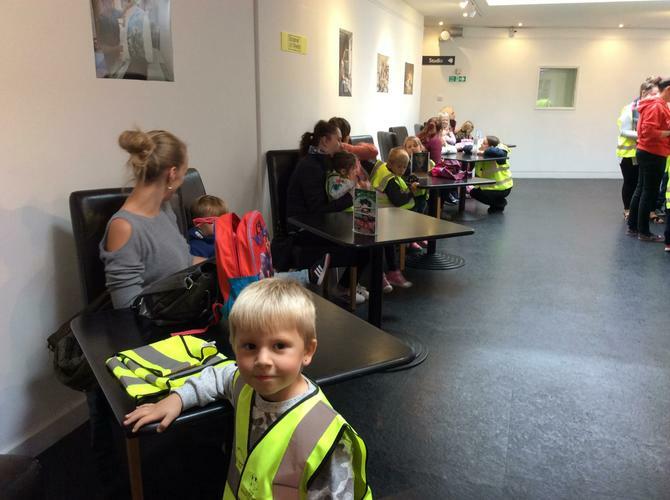 We went to the Brewhouse Theatre to see "Flip, Flap and Fly!" 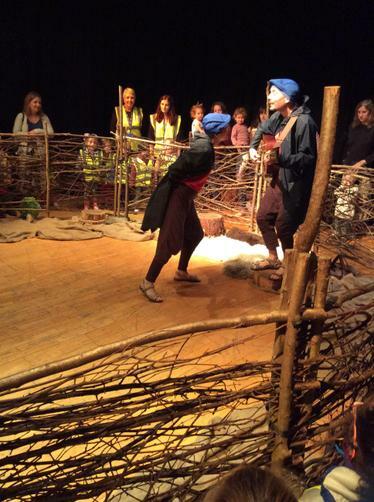 - a play about a baby bird learning to fly! 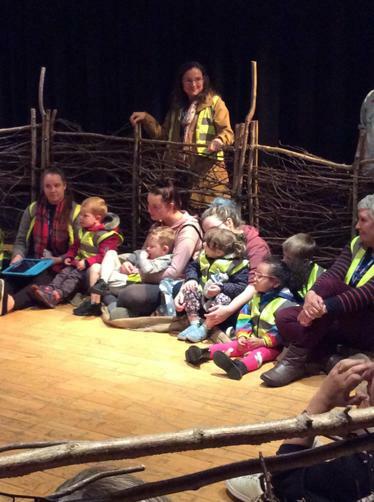 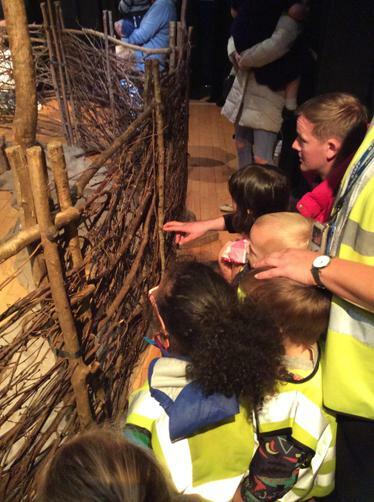 We had a wonderful time and loved joining in with the actors. 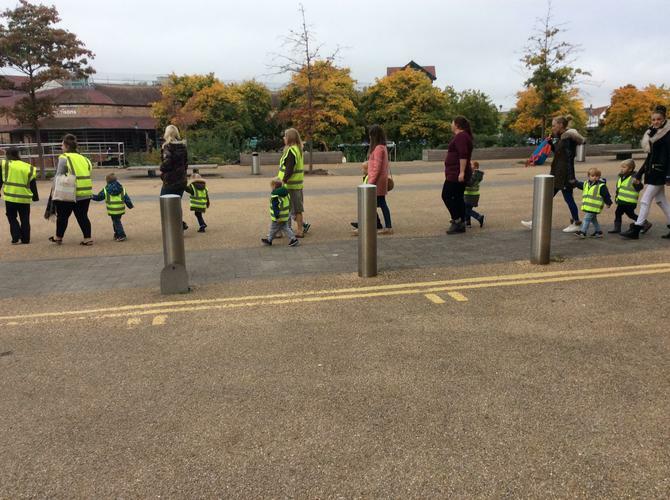 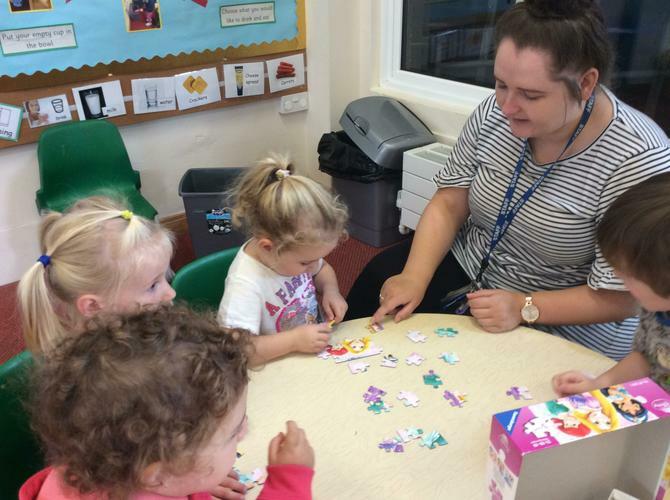 This term in Acorns we have been settling in to our nursery routines. 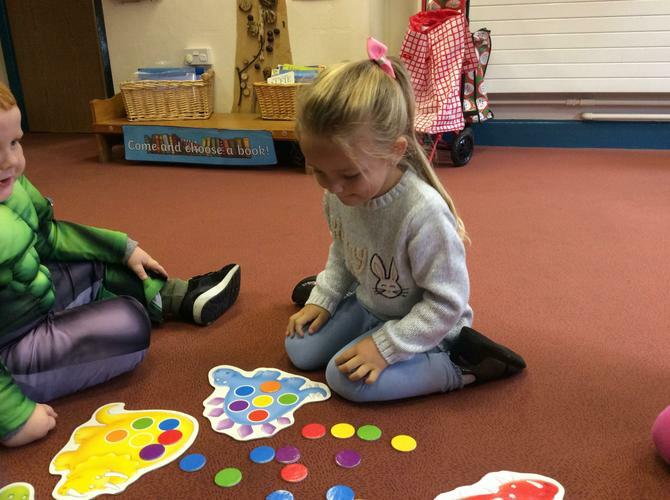 We have enjoyed turn taking games to get to know our new friends. 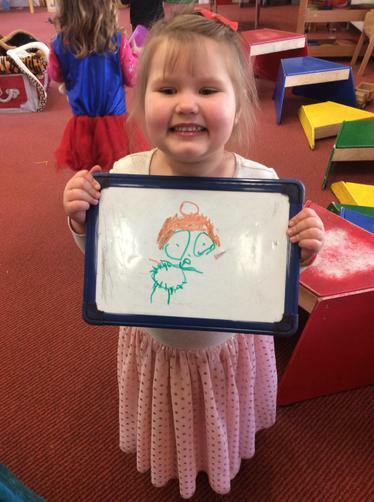 We have also been getting to know our key person through our play and adult led activities. 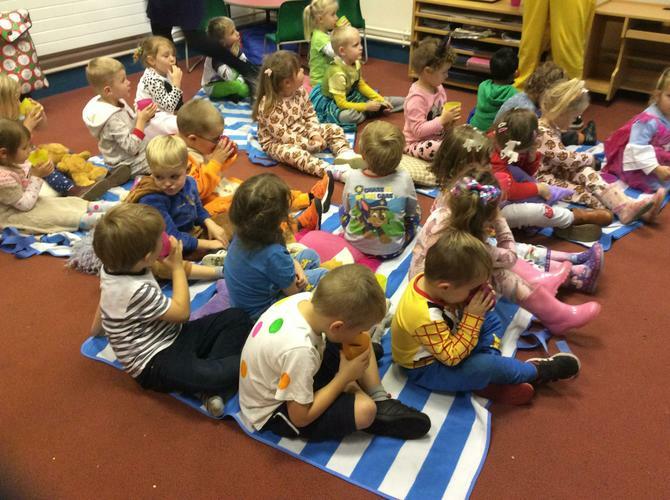 We love singing time and taking part in the songs!